Ever since I joined the candy addict club as a very young child, I have been partial to Reese’s Peanut Butter Cups. In close second is every other version of chocolate and butter and nuts that exists. It’s just simply the best. But since then, I have unfortunately (fortunately?) faced the reality of the many questionable ingredients in my favorite candy, and looked elsewhere for my fix. There are many competitors at Whole Foods, but the high price combined with tiny portions is off-putting. Which leads me to the creation of my own Reese’s-like cup. Pinterest has provided much inspiration, as always. There are a million versions of chocolate peanut butter cups, and I’ve tried a few with success. But in the past year I’ve realized sunflower butter is my true love when it comes to the butters, and it’s not even a nut. 🙂 My favorite brand is “Once Again Organic” and their sunflower butter is creamy with just a touch of sweetness added. You could also add a little honey or maple syrup to an unsweetened version to make this chocolate cup a little more “candy-y”. Cloud Thyme is back! It’s been a bit of a hiatus because life kind of exploded, in a good way. 🙂 A few major life events in no particular order…a new (psycho but so wonderful) puppy, engagement, Montessori training/internship, a wedding (best day of my life! ), and a new home. So now, as my happy little family settles into this lovely house, I am ready to get cookin’ and bloggin’ once again! For once, we Seattleites are just so relieved that the rain and cooler weather has arrived! Our homes don’t come with AC for a reason! While I was happy to wear a sundress at the end of April, I’m pretty over it now. Boots and Patagonia jacket ready. But more seriously, this heat has been particularly scary for many areas of the PNW with the raging wildfires. As my beau and I are planning our wedding in the Methow Valley next spring, we are more personally grateful for the storms and rainy weather this weekend. 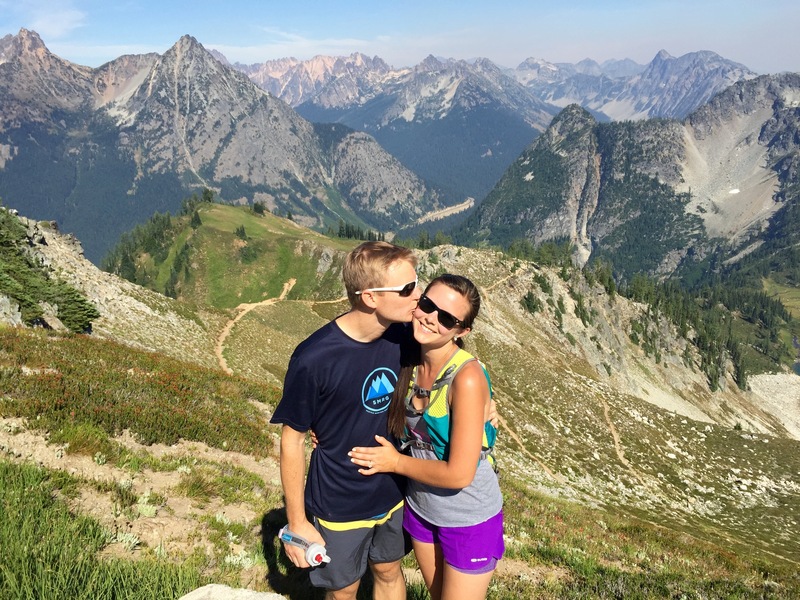 Now it is time for the Northwesterners to truly dance in the rain, so that places like the North Cascades stay as beautiful as ever! To truly celebrate this turn of seasons, I decided it was only appropriate to cook up a batch up something pumpkin – the best of fall. I considered a baked good that is acceptable as breakfast, snack, or dessert and immediately thought – muffin! Just sweet enough for it to be a treat but healthy enough for morning breakfast with coffee. Not only is this vegan muffin made of vegetables (well just pumpkin) but also fruit (apple, banana, coconut), nuts, and whole (gluten-free) grains. A celebratory muffin for sure. For those of you still wondering what hemp hearts are, they are the shelled hemp seeds, which come from the hemp plant. Appropriately, my boyfriend and I first learned about these when wandering in Portland and an old (very hippie) man went on a 15-minute passionate speech about how he lost 50 pounds because he eats hemp hearts on EVERYTHING (and was wearing all hemp clothing and probably using “hemp” in many ways…) But don’t worry, these seeds come from a hemp plant that is only a cousin of the Marijuana plant and contains only 0.001 percent THC. 🙂 These “hearts” are nutritional powerhouses, and have more protein than any other seed, and are full of healthy omegas and antioxidants. They also have a delicious nutty taste and delicate crunch, which make them a perfect addition to salads like this one. 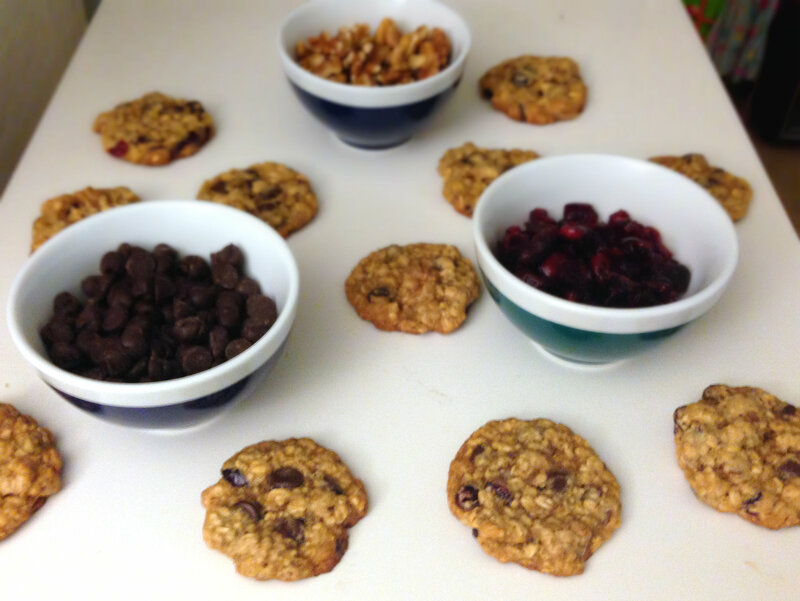 I was planning to call these trail mix cookies, but they’re really much more than that. So they are endurance bites. Sounds official, yes? Now that my ultra-marathon-runner boyfriend has gotten me hooked on all the pocket fuels and bars for hikes and runs, I realized I needed to make my own, unprocessed, ones. These are literally endurance bites, as in they give you the lasting energy you need and fulfill your sweet tooth in just one bite. Easy to eat on the go, which is a bonus for pretty much anyone…athletes, moms, workaholics, backpackers, etc. During the workday, I especially appreciate that I can sneak one in without the kiddos noticing! 😉 That being said, this is a pretty great option for kid-friendly snacks too – all the sugar is from fruits! I decided to make two versions of these endurance bites. Both are vegan/gluten-free, but one is also grain-free, which does make it taste a little like a Lara bar, whereas the one with oats tastes more like a traditional cookie. Both are full of healthy nuts and fruit, and are easily digested when all ground together and baked. 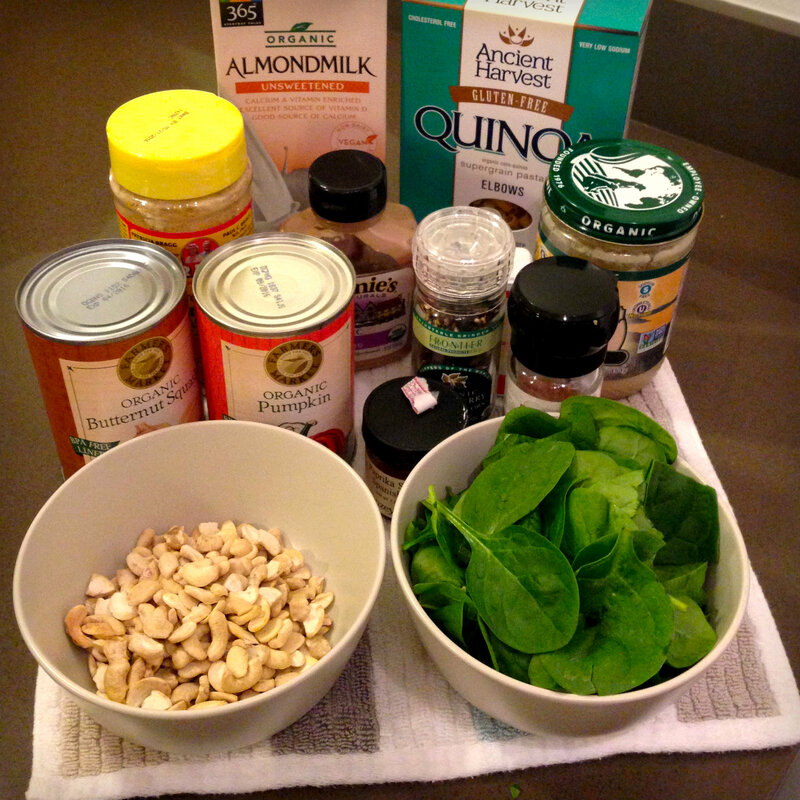 Both are also easily adaptable with different types of nut butter, mix-ins, and grains. Neither of these cookies have any butter, oil, or refined sugar of any kind! Yet they still have that delicious, sweet trail-mix taste that I love, and the fuel to keep me going. I eat plenty of these while I bake and straight out of the oven, but these do taste especially amazing when on the top of a mountain! I’ve always had the notion that I don’t like gazpacho, because I only considered the too-acidic-for-my-taste tomato version. But the other day, when I was craving soup on a sunny day, I got on Pinterest (my addiction) and realized there are tons of non-tomato variations of gazpacho! Immediately my mind went to avocado, the unparalleled summer fruit/vegetable/superfood. 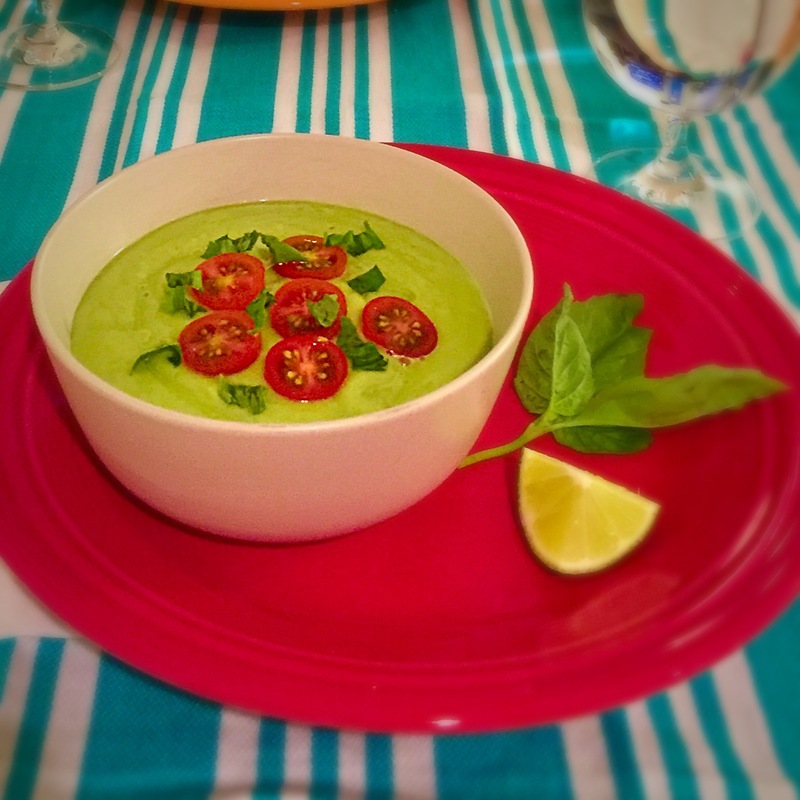 So I decided to make a gazpacho that I do really like, with a refreshing blend of a few of my favorite summer flavors: avocado, cucumber, and basil. The Vitamix gives this soup the perfect fluffy and smooth texture, but a good blender should do the trick too. For a lighter soup, add more broth, and for a super quick version, omit the sautéed onion and garlic. Feel free to try out different herbs too, like mint or cilantro! This soup is delicious on its own, topped with grilled prawns, or as an appetizer or side dish. My favorite way to serve this is garnished with tomatoes and enjoyed with a quesadilla (with Daiya vegan cheese). 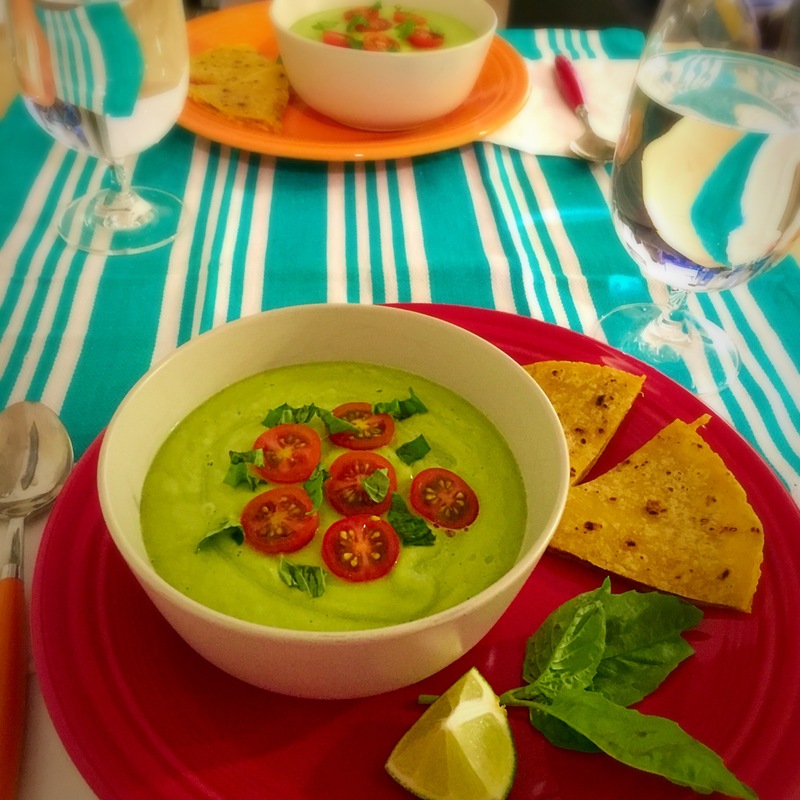 This avocado gazpacho is the perfect dip for that quesadilla too! Each week, I try to make at least one new recipe, usually with seasonal veggies and as colorful as I can. (I take “eat the rainbow” quite literally.) Although I thought I had recently been pretty varied in my recipe creations, it turns out quite a few of them have been featuring one special spring ingredient – asparagus. Although asparagus has an unfortunate “odoriferous” reputation 😉 it is without a doubt, one of the most delicious and versatile veggies, particularly during Seattle spring season. Beyond the tasty crunch that asparagus adds to dishes, it is full of wonderful nutrients, including, but not limited to, vitamin K, B vitamins, folic acid, antioxidants, and a special compound called glutathione, a detoxifying compound. Apparently, eating asparagus at dinner can even help prevent a hangover! Others claim it is an aphrodisiac. Clearly there is good reason to eat plenty of these yummy green spears. Which leads me to a few of the ways I’ve been enjoying my asparagus lately. These are just some ideas, not complete recipes, so feel free to leave me a comment or send me a message if you’d like more details about one of the dishes! And as always, let these be inspiration for your own creations! It’s hard to believe I was in Maui just a few weeks ago…it already feels like a distant memory, but the best of memories. I don’t think it’s ever been so hard to come back home from vacation! The beaches, landscape, sun, hiking, snorkeling, sunrises, towns, relaxation, and not to mention the food(!) were just perfect. My boyfriend and I are already discussing our return trip next year. 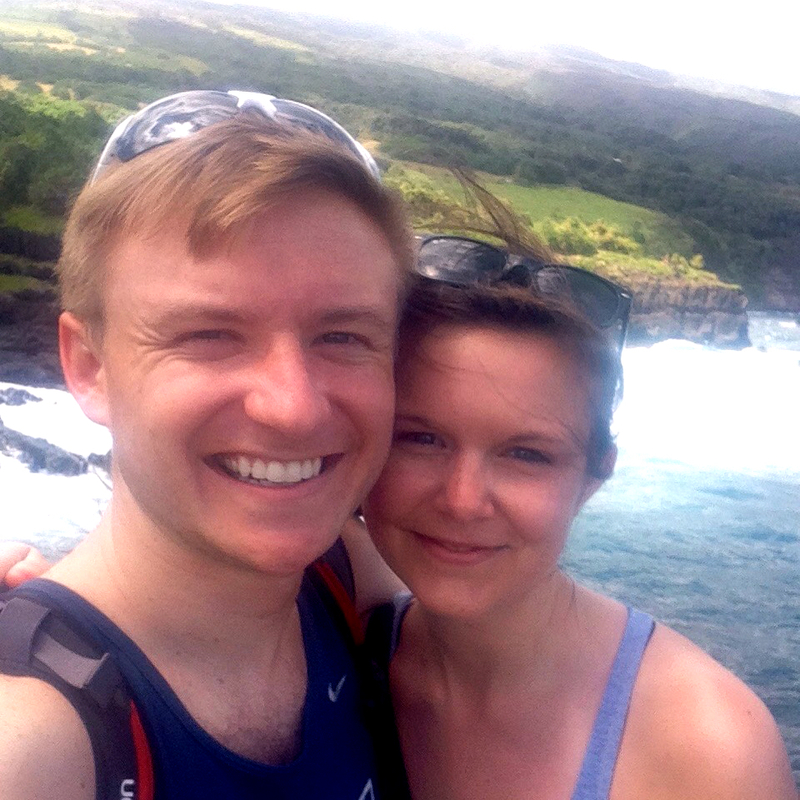 Beyond our outdoor adventures, we of course spent quite a bit of time discovering the best places to dine, whether it was for a refreshing shave ice or a classy beach-front dinner. We had a little too much success! By far the best dessert we had was something called the “Pono Pie“. We ate this delectable treat at the barefoot bar at Hula Grill, while a Hawaiian man sang and woman danced. Life doesn’t get much better. The Pono Pies are made by a chef on Maui, and they are completely raw, vegan, gluten- and GMO-free, and are made from local breadfruit, macadamia nuts, coconut, and other fresh fruits and flavors. They looked and tasted quite a bit like cheesecake, but are entirely plant-based. Although I knew I couldn’t replicate this treat exactly, I wanted to try a simpler version that included a couple of the staples of Maui: macadamia, coconut, and citrus. I also wanted a heartier nut crust, to balance out the creamy coconut filling. Just like the Pono Pie, my version is made entirely of plant-based ingredients, and free of dairy, egg, grain, and soy. And still, or maybe due to this, it is deliciousss, and plenty sinful tasting! It’s quite filling, but despite my best efforts, I can’t seem to stop at just one sliver. Best of all, it’s incredibly easy to make and involves no baking or heating at all! All you need is some type of blender or food processor, and a freezer. One budget tip: macadamia nuts are ridiculously pricey, so if you’re looking to save, feel free to use cashews instead. It will still taste great. You can also get creative with the cheesecake filling and add different types of flavors, for example orange or mango, or even lavender or almond extract. You could also always add chocolate – that is always a winning version in my experience! Also, for those who have an extreme sweet tooth, feel free to add a touch more sweetener to both the crust and cheesecake. Aloha! For the past month, I have been immersed in reading. 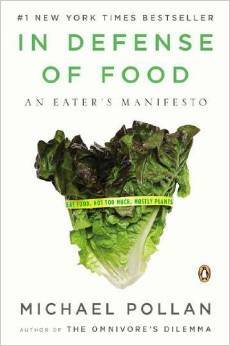 Not for any academic purpose for a change, but rather for the love of food, health, and overall well-being. Since dating a vegan (who only does so for the sake of running ultramarathons) and listening to the Rich Roll podcast, I have been especially inspired to research the benefits of a mostly plant-based diet and the roots of this diet based on Chinese traditional medicine. I am still in the midst of getting through these books but I have already learned so much, such as how to best get essential nutrients (even b vitamins) from various plants and herbs, the best ways to combine foods to maximize vitamin absorption and digestion, and the way every person requires a different sort of diet based on their temperament, body temperature, and cravings that may or may not fit with what you originally deemed “healthy”. Thus I have taken out my nutrition facts box because the focus really shouldn’t be on “carbs” vs. “fat” or even grams of sugar or calories. The focus is back to the whole foods and all the benefits (to the mind as much as the body) you get from the entire vegetable, fruit, grain, or seed. In other words, “the whole is more than the sum of it’s parts”! More than anything, it helps to remember just how tied together the brain, the tummy, the heart, and the body are, and eating plants and whole foods is the best thing you can do for all of you! I have so much more to say about all that these authors have taught me, but for now I’ll give you a list of the readings I’ve been doing lately, and maybe you will be so inspired too! Now, to the recipe. I combined my plant-based reading with memories of a fun and classic old favorite – tater tots – to come up with this cauiflower tot recipe. I spend most of my time with small children and they definitely inspire me to come up with kid-friendly (and also veggie-filled) recipes. 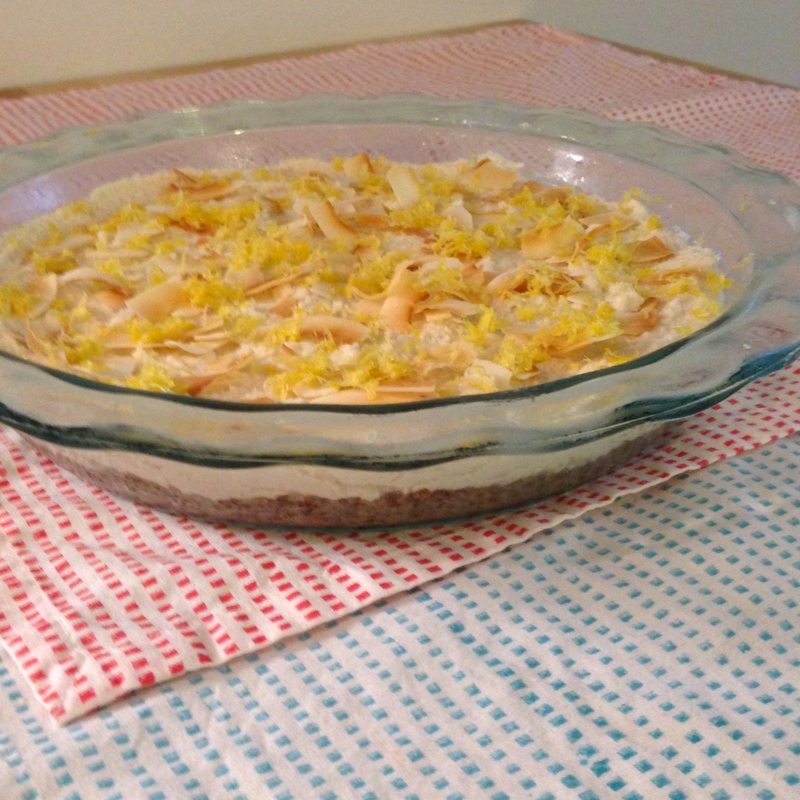 This recipe is not only fun to eat, but also to make! One of the perks of plant-based cooking is that even the batter and doughs are edible and safe for kids to play and cook without over-stressing about the sanitizing and hand washing after. Plus, cooking is the perfect opportunity to try new foods and learn about all types of vegetables and new ingredients. Win for all! Cauliflower was the obvious substitute for the good-old-potato in this recipe, because it is oh-so-trendy as of late. It’s been used a lot as a substitute for rice, and apparently it also works quite well as a tater substitute. I’ve always loved cauliflower raw and on it’s own, but it’s also neutral enough that it is perfect for blending with other ingredients and flavors (just like a potato). And also like a potato, the leek is a perfect compliment, along with simple ingredients to create the texture, gooeyness, and nutrition that make up these tots, such as garlic, parsley, vegan cheese, and cornmeal. Simple foods on their own, but delicious in combination with each other. This has been the winter of soups. Whether it’s a side dish puree made from my boyfriend’s amazing vitamix, or veggie pho from my favorite Vietnamese place, I am probably consuming some type of soup everyday. Nothing warms the body and soul like a good bowl of delicious soup. 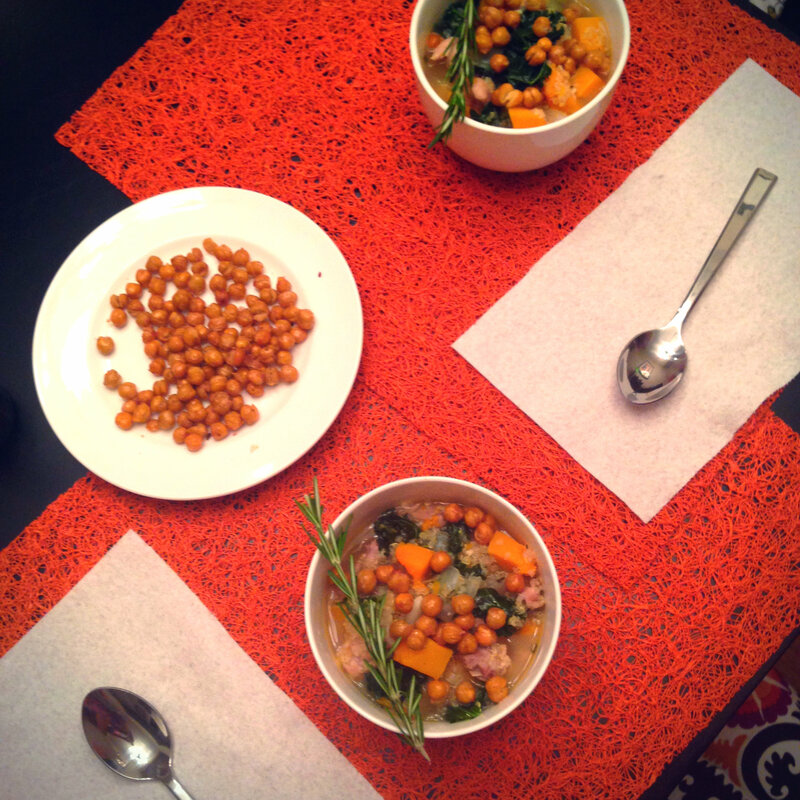 Lately I’ve been trying to make soups that are healthy but also hearty enough for a dinner entree. One-pot meals are truly the best on busy weeknights, especially when you can have leftovers the next evening. This one literally takes 30 minutes or less from start to finish. 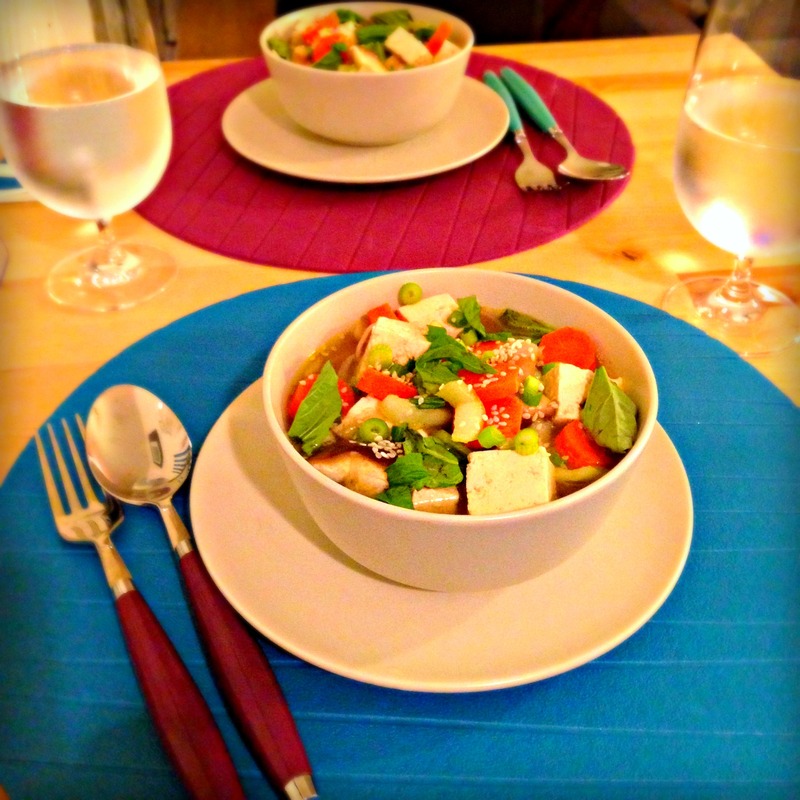 Since my go-to eating out soups are Japanese miso, Vietnamese pho, and Thai tofu soup, I decided to combine them all! Luckily, it turned out delicious and exactly what I was hoping for, and undoubtedly better (and cheaper) for me than the restaurant versions. The base of this soup is the miso broth, which Whole Foods does sell, but if your store doesn’t, it works to mix miso paste with normal vegetable broth. Just be sure to buy the white miso paste, because it has the mellow flavor that we’re looking for. 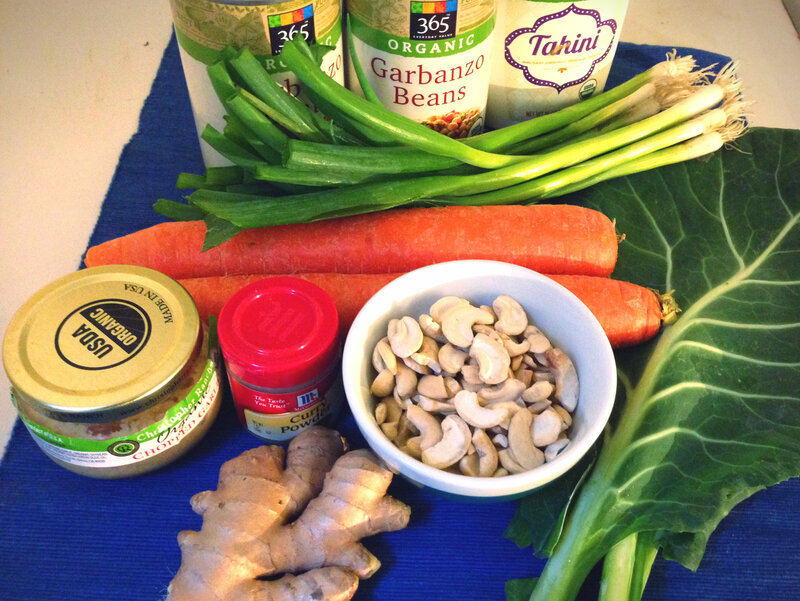 The tub of miso will last at least 6 months in your fridge too, so it’s good to have around – yay probiotics! Extra tip: If using miso paste, be sure to wait until near the end of cooking to add miso paste in order to reap the maximum probiotic benefits. 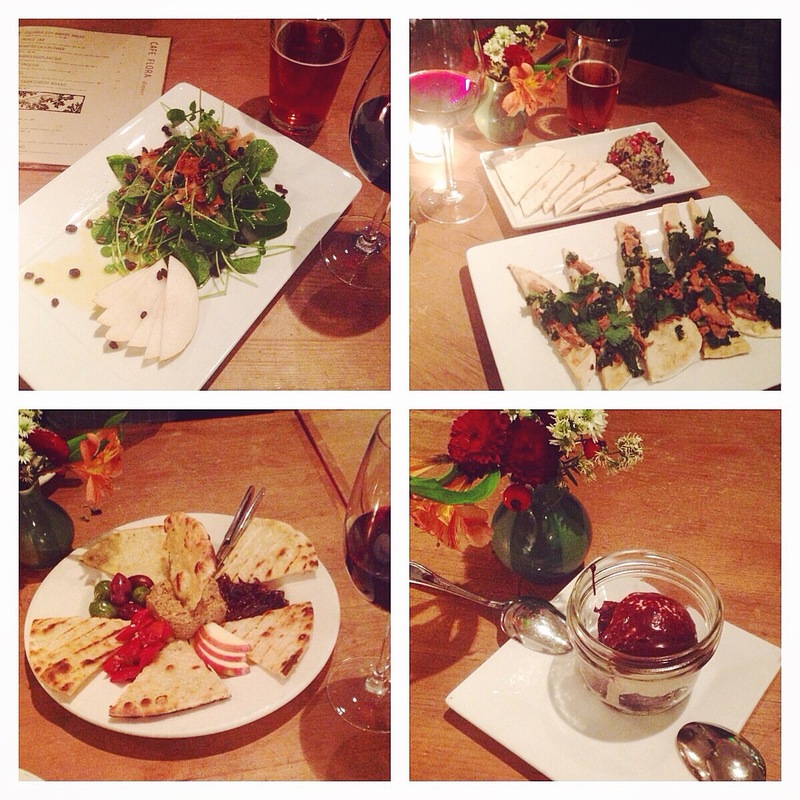 Not only is the food entirely vegan, it is also organic, local, seasonal, gluten-free, and soy-free. Their ability to make an entirely plant-based meal so creative and delicious is inspiring. I have posted the entire menu for your enjoyment, and I can honestly say that every single dish was incredible. Highlights: The celery root leek soup with shaved truffle on top was perfectly smooth and wonderful. The saffron cashew cheese paneer was really creative and was an excellent match with the winter roasted vegetables and herbed tomato sauce. Another fun part of each dish was the inventive “sprinkles” such as candied sunflower seeds, fried capers, and parsnip chips. And they completely won me over by ending my night with caramel coconut whipped cream over chocolate! Amazing. This has been quite the week of holiday cooking and baking…and it makes me so happy. #23917 why I love Christmas. My little apartment just smells amazing all the time. 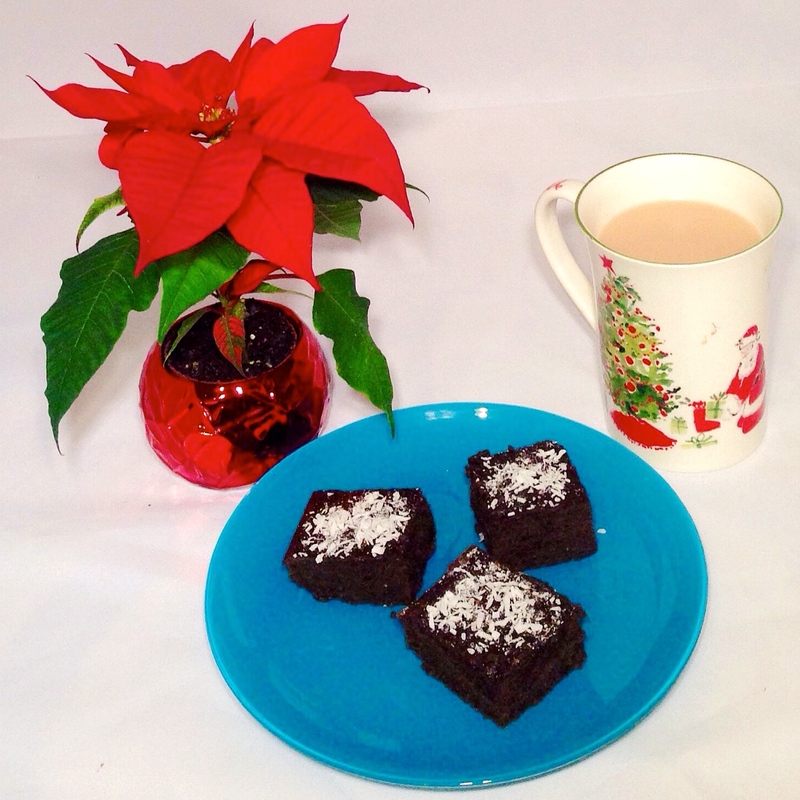 And I just couldn’t let Christmas pass by without posting a new recipe for a sweet treat. One of my favorites this time of year are the traditional gingerbread cookies. I love the cutout ones, particularly getting fancy with the icing, but sometimes simple is best. So I made my own version of gingerbread that is super quick, impressively healthy, and just plain delicious. These are, unsurprisingly, completely vegan and gluten-free. I tried a new flour this time, that has more starch and doesn’t require the added ingredients like xanthum gum: Buckwheat flour. Contrary to what the name implies, buckwheat is not a wheat at all; rather, it is a type of seed related to rhubarb and sorrel. It has no gluten, but it is full of good fiber, b-vitamins, amino acids, iron, magnesium, and antioxidants. I combined this super-flour with almond meal for added protein and nutrients. The rest of the ingredients include a combo of pumpkin, maple syrup, molasses, and coconut oil for sweetness and moistness, and then lots of spices for flavor. The result: a decadent, dark, melt-in-your-mouth gingerbread bar bursting with Christmas flavors. To jazz these up a bit, sprinkle with powdered sugar or shredded coconut. Or if you want to get real fancy, you could cover with a coconut-cream based frosting! Macaroni and cheese has been a fad for quite some time, especially in Seattle with Beecher’s “world’s best” mac & cheese. Unfortunately this world famous cheesy goodness doesn’t work for those like me who avoid dairy and gluten. Despite this, I have enjoyed some pretty good vegan and gluten-free mac & cheese at Veggie Grill and actually spectacular version at Petunia’s in Portland. 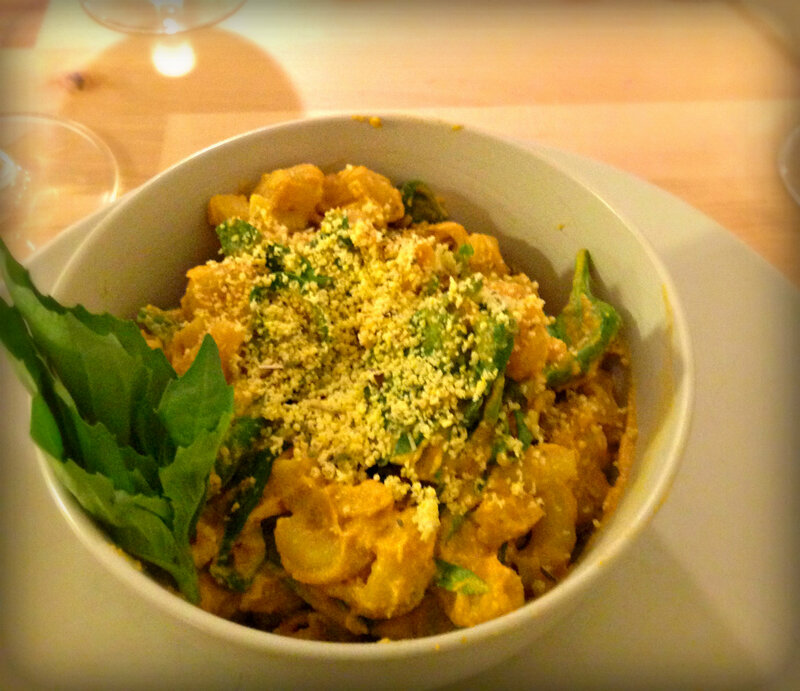 But the real way to enjoy comfort food is in the peace of one’s home, so as you might expect, I made it my mission this winter to create my own recipe for homemade dairy-free and gluten-free macaroni and cheese. Although my blog has always focused on my own recipe creations, I will admit that I also thoroughly enjoy someone else cooking for me. Not only do I get to avoid hand washing dishes, but I actually get a lot of inspiration from the local restaurants, especially in Seattle, a foodie heaven. These past couple of months, my boyfriend and I have made a mission of exploring the many vegan and gluten-free restaurants of Seattle and I am amazed how many there are yet to try. So as something a little different, I am going to provide a review of a few of my favorites in the city, with more to follow in future posts. My hope is to introduce both locals and Seattle visitors to some excellent spots that will please vegans, gluten-freers, and omnivores alike! This is one of my favorite restaurants ever to exist. With it’s gorgeous ambiance mixing indoor with outdoor (plants included), it just feels inviting and relaxing. It is a large restaurant with plenty of seating, so it’s never too long of a wait, especially if you want to spend the time sipping one of their artisan, aromatic cocktails at the bar. The staff are beyond friendly, super helpful, and perfectly hipster. But what really brings me back here time and time again is the incredible food. Their entire menu is vegetarian, and most of the dishes can be modified to be vegan, gluten-free, and/or soy-free. It is on the pricier side of the vegan restaurants I’ve tried, but totally worth it, especially to try an assortment of dishes. They offer brunch and lunch, but I have only been there for dinner so far, mostly because I am obsessed with their Chocolate Brownie Coupe. This dessert is both vegan and gluten-free, and is essentially a decadent Theo chocolate brownie with coconut ice cream and hot fudge sauce. It is small so don’t pretend you just want to “share” this one with your partner! Beyond the dessert, the savory items are wonderful as well. One of my favorites is the Roasted Flatbread with celery root puree, garlicky greens, roasted chanterelles, and sea salt. You can make this gluten-free, and I promise you their gluten-free bread options far exceed the norm. Somehow their gluten-free pita still maintains the chewiness and softness that wheat bread has. Glutenous or not, this flatbread has a lovely earthy flavor with the perfect amount of savory and salty. All of their salads are are refreshing and creative, but my favorite is the Asian Pear and Persimmon Salad. 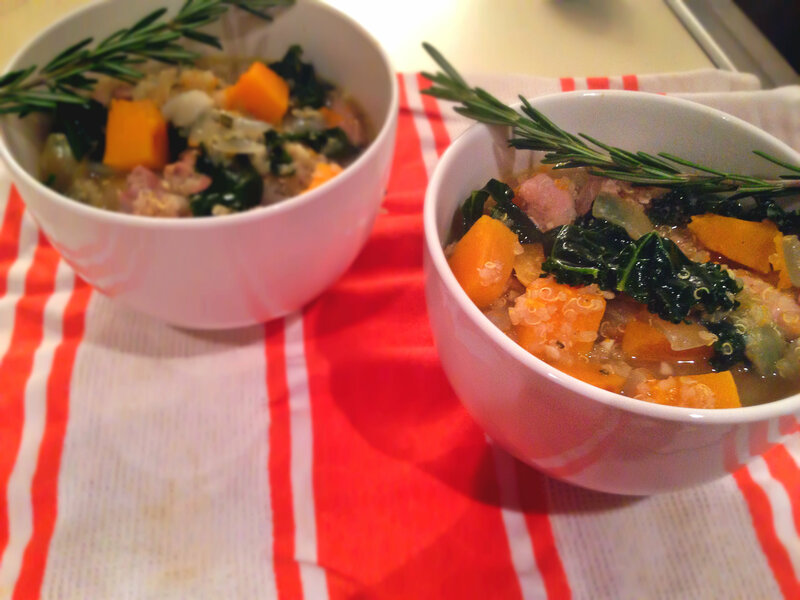 It has a bright citrusy flavor to balance out the other hearty winter dishes. The dried huckleberries and spiced cashews are a fun punch to this salad as well. Rice Crispy Treats are just one of those timeless desserts. They remind you of childhood but taste just as good when you are old (and perhaps with refined tastes). Maybe they’re only delicious because I have such fond memories of eating the sticky sweet squares at the end of a “rigorous” soccer game, or adding red and green rice krispies to make them “Christmas-y”. But something about the simple combination of rice crisps, sugar, and a touch of salt just always hits the spot. As a child I tried many versions of these (both packaged and homemade) but this was my first attempt at a more nutritious version, and I am pleased to admit that I like these even more. Although not a mother, I work with a lot of toddlers and kids, and am always aiming to find unprocessed and refined-sugar free treats that they enjoy too. This was a win, because these treats are likely to please even the littlest and pickiest of tastebuds. They are free of all the “fake” stuff and instead made of organic brown rice crisp cereal, peanut butter for a little added protein and flavor, brown rice syrup, and of course the dark chocolate to balance out the sweet and salty. With more and more child (and adult) allergies and sensitivities, these are super safe too, particularly if you sub almond butter or sunbutter for peanut butter and leave out the chocolate. Best of all, they take about 10 minutes to make, and no baking involved! I had never cooked with brown rice syrup before, but was really pleased with the result. Unlike agave or maple syrup, this syrup is really thick and helps to keep the crispy treats together. I actually don’t think this recipe would work with anything but brown rice syrup, or maybe honey too. Not only does the nut butter add the extra richness and flavor, but it also helps with the perfect gooey/sticky consistency of these treats. So make these your own, get creative, give in to your sweet tooth, and spread the timeless tasty goodness around! Tis the season, of course. I think I strategically put up a pumpkin post in September so that I could squeeze in 2 pumpkin-themed posts before Halloween this year. 🙂 Although the recipe below doesn’t actually contain pumpkin, it has the pumpkin spice blend that gives fall such a wonderful aroma. It’s hard not to appreciate all that fall brings (even the wind and rain) when these are baking in the oven and that sweet spicy smell permeates through the home. Already in the first half of October I have had my inaugural pumpkin spice latte, roasted countless squashes, been to a pumpkin patch where I picked my own pumpkin and wandered through a chicken-riddle-filled corn maze, carved a “scary” bat jack-o-lantern, and drank several varieties of pumpkin beer. I take my seasons seriously! 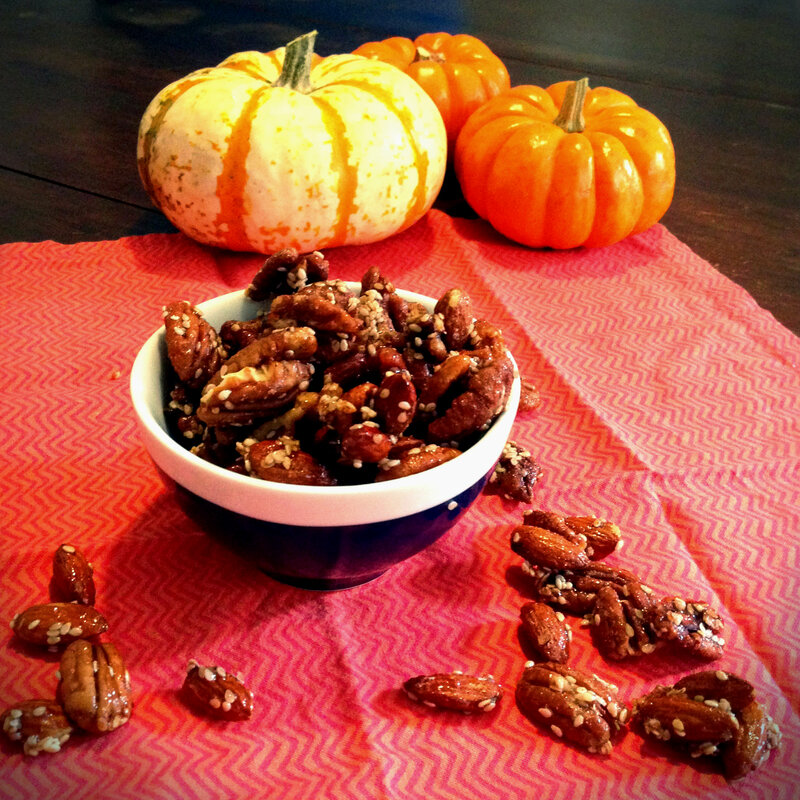 These candied and spiced nuts are the perfect addition to all the fall adventures. With just the right amount of sweet, salty, and spice, they give the common handful of nuts some pizzazz. Yet they still have the wonderful and beneficial protein, nutrients, and healthy fats that almonds, pecans, and sesame seeds provide on their own. These little treats have been my go-to snack at school, post-workout, and even at the recently viewed Gone Girl (highly recommended btw). My friend described them as tasting like caramel corn, so that is obviously a good thing. I can’t say these are a replacement for fake butter movie popcorn, but they may be a healthier and tastier alternative to some of the other ridiculously priced treats at the theater! 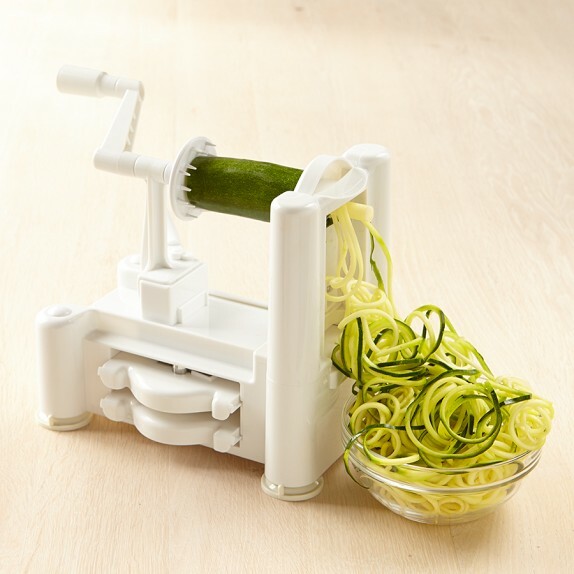 I hear there is a new iPhone 6 and other fancy tech releases, but my most exciting gadget of late is a SPIRALIZER. If you are in the health foodie world, particularly in the Instagram-land, you definitely know what this is. For those of you who don’t, prepare to be amazed (or not, but just pretend). It is a device that turns veggies into curly noodles! See photo below. Which explains why I call my spiralized zucchini “zoodles”. I feel like a little kid at Christmas with this new toy, and it has given me a whole new reason to be adventurous in the kitchen. The recipe below is my favorite spiralizer dish so far, and it even got the seal of approval from my non-health-nut friends. A couple of people at the potluck I brought this to said they didn’t even realize they weren’t eating actual noodles! If you are interested in purchasing a spiralizer, they are pretty inexpensive on amazon. Here’s the one I bought. However, if you don’t want one, and you’d like a different way to make zoodles or something close, here are some great methods on Wiki How. No matter what your zucchini looks like in the end, this thai peanut veggie salad will be delicious! Although I thought I had truly transitioned to fall with my pumpkin pancakes, the sun and potluck event really brought the summer back into me. So I made one last summer recipe, and it was an excellent decision. The vegetables in this salad are all raw (except for the corn, which is lightly boiled), which gives it a nice crunch and bright flavor. Due to the extreme healthfulness of all the raw veggies, I created a creamy and sweet dressing (heavy on the peanut flavor) to balance out the lightness. This is a sweet and tangy peanut sauce that would be perfect with all kinds of dishes, and will definitely be used on stir-fries and salads in the future. Peanuts sometimes get a bad rap now that almonds and walnuts have taken the forefront in superfood nuts, but peanuts have a lot to offer (assuming you aren’t allergic – if you are, use almonds!) They are definitely less expensive than the average nut, and have more protein and folate than any other variety. Folate isn’t just beneficial for pregnant women either! It’s known to have brain-boosting properties for everyone, and some research shows it can help prevent depression and dementia in older people. And that is all for my little peanut pep talk. As always, feel free to substitute other veggies, such as cucumber, tomatoes, avocado, etc. I served this as a side dish at a potluck, but it could also be a main dish, and perfect as a cold to-go salad to bring to work or school. It would also be delicious topped with tofu or chicken for a heartier meal. 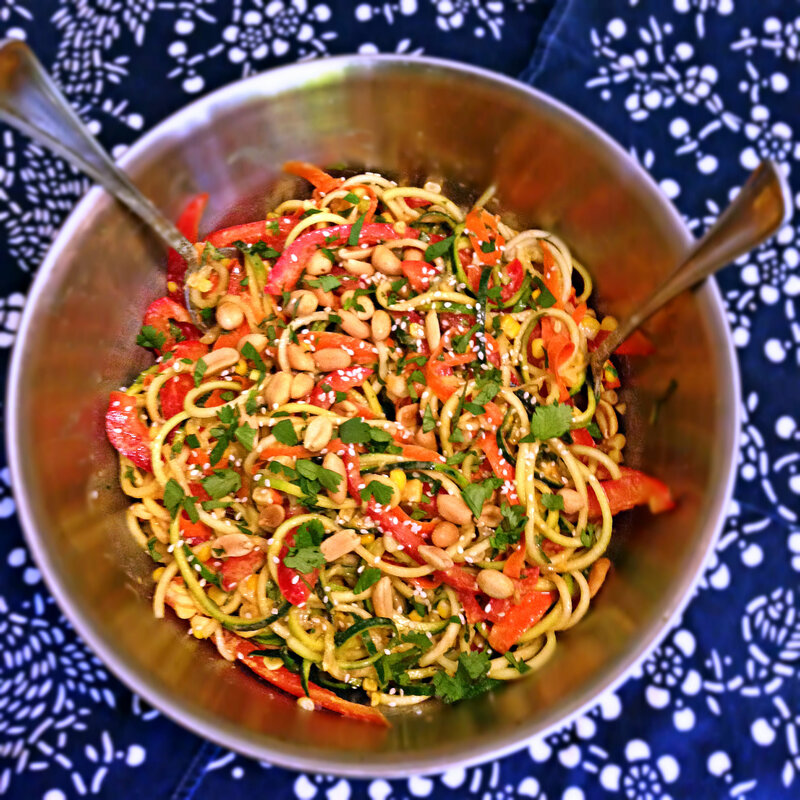 I hope you all enjoy making and eating this zoodle salad as much as I did! I don’t think anyone disagrees that brunch was a wonderful invention. The word ‘brunch’ first appeared in print in the late 1800s by the British author Guy Beringer, who put it perfectly: “It puts you in a good temper, it makes you satisfied with yourself and your fellow beings, it sweeps away the worries and cobwebs of the week”. Yes. What I like even more about the history of brunch is that it really became popular in the U.S. post WWII, when more and more women were working full-time and thus deserved a little break (maybe even a cocktail!) on Sunday. Women (and men) could dine out, and just relax the morning and afternoon away with good food and friends. Even though I’m an early riser, and generally enjoy a light breakfast to start my day, that never stops me from indulging in a mid-day meal, particularly when it involves delicious food, coffee, and good company. Despite my deep appreciation for brunch, I rarely make it myself. It’s typically a meal I reserve for going out to restaurants, or eating at my relatives’ houses on holidays. And due to my dietary preferences/restrictions, that often limits what I can eat at brunch. There aren’t too many restaurants that offer gluten-free or dairy-free eggs benedict or french toast. So I typically eat omelets, scrambles, and vegetable hashes, which are always delicious, but don’t quite fulfill my sweet-tooth craving. As you can guess, this led me to a new mission of creating my own sweet brunch recipe, and aptly fall-themed: pumpkin pancakes! I can’t say that I’m ready for summer to end, but I will say that pumpkins (and pumpkin-flavored foods) are on my favorite parts of fall. This may be hereditary, given the fact that my sister has an entire Pumpkin Party every October! There is something so lovely about that sweet yet savory taste of pumpkin, that works in all kinds of baked goods, drinks, salads, and stews. Yummm. Not only was this my first time using pumpkin in a pancake recipe, but also my first time making a gluten-free and dairy-free pancake. I decided to use coconut flour, because you need very little of it at all, which results in a fluffy and syrup-absorbing pancake. The blend of spices, pumpkin, maple, and coconut give this pancake enough flavor that you hardly need toppings at all, but that shouldn’t stop you, if you are so inclined. 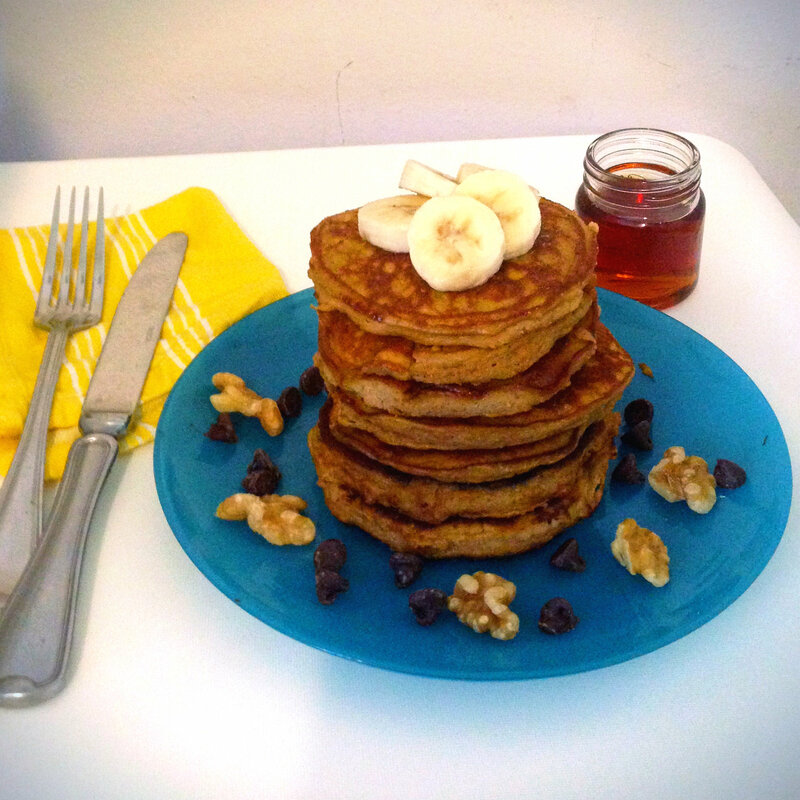 As you see from the photos, I went with a decadent topping combination of banana, maple syrup, walnuts, and chocolate chips! An excellent choice to complement the much-adored pumpkin. So feel free to cook this up for your next in-home brunch, or just make a few pancakes for yourself as an anytime-of-day-treat! It is about as nutritious as sweet brunch foods go, and tastes anything but. I am currently devouring my 2nd helping as I type this blog post… 🙂 Happy Brunching and Pumpkin Fall! Due to my life as a grad student, and my desire to be outside in the sun as much as humanly possible in the summertime, I am often “on the go”. I am always moving (by foot, bus, or bike) from lab to class to meetings to babysitting to barre to grocery store, and finally home. I’m busy and I like it that way! So I pack a million things in my Mary Poppins bag to fulfill any need that may occur throughout the day. Unsurprisingly, my need is often in the form of hunger. For both financial and health reasons, I really avoid buying packaged snacks and meals, so I make sure to pack a variety of food in my giant bag. This summer, I have found I am somewhat limited by things that won’t spoil or melt in the hot sun that I spend much of my time in. And although I have an abundance of snack options, lunches on-the-go are somewhat trickier. I need something portable, filling, quick, completely pre-made, and enjoyed at a lukewarm temperature. 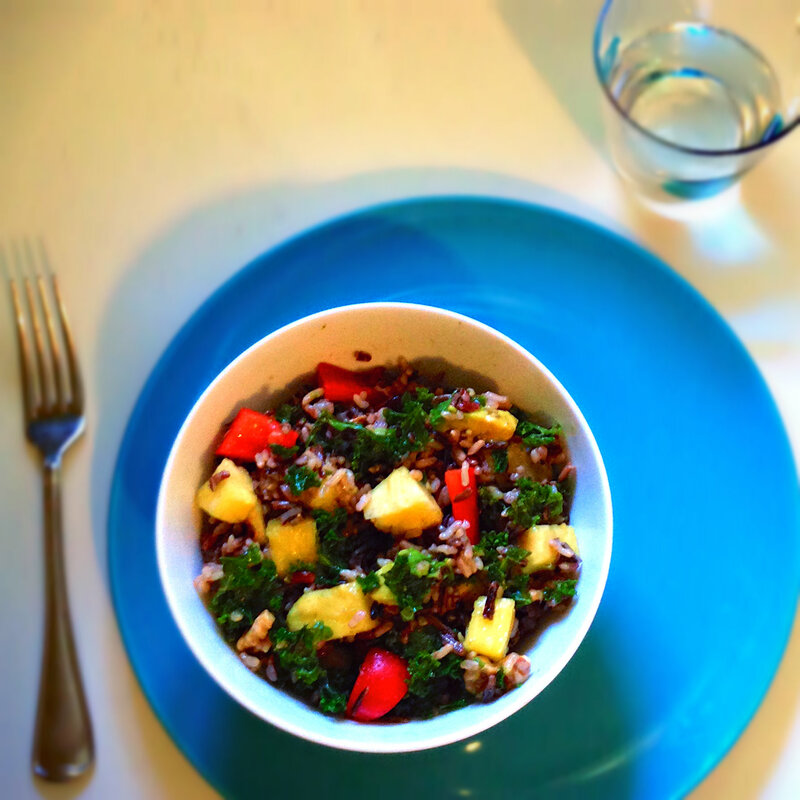 This summer wild rice salad completely fits the bill! 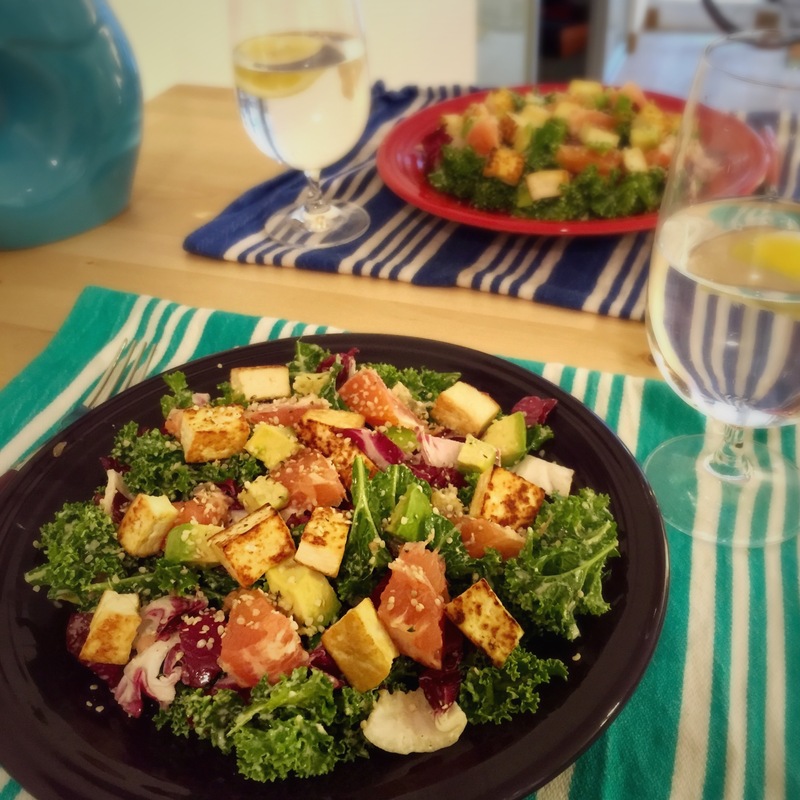 This salad is hearty enough to keep me satiated for a few hours and is filled with nutritious and flavorful ingredients. And it tastes good whether it’s straight out of the fridge or has been sitting in my bag for a couple of hours, which is something I’m quite proud of! I was inspired to try a new gluten-free grain salad because about this time last year, I made my favorite summer quinoa salad, which I still love but it’s nice to have a new variation every now and then. Besides, wild rice is a grain that does not get enough attention! It has more antioxidants and protein than any other rice, and is loaded with healthy fiber, minerals, and B vitamins. I like to buy wild rice blends, but it’s delicious on its own as well. With all the fresh ingredients added, this salad has my favorite balance of sweet, tangy, and earthy, and salty. I just love getting to eat so many of my favorite ingredients (kale, pineapple, avocado) all in one simple dish! It’s the little things in life. 🙂 The walnuts provide extra protein, but you could also add garbanzo beans, chicken, or tofu for an even more substantial meal. Enjoy this salad by itself in the last days of sunshine, or as a side dish at a potluck, or even on your way from one meeting to the next. Here’s to supporting other foodies “on the go”! The celebrity in this post is really the heirloom tomato. I only just recently discovered how much more delicious those giant multi-colored tomatoes you find at the farmers’ market and Whole Foods are than the conventional kind. I also only recently learned that the reason they are called “heirloom” is due to the fact that they are a variety that has been passed down through generations, and are non-hybrid. But it’s not their history that has drawn me in; rather, it’s their incredible sweetness and juiciness, not to mention their beauty! It has been a summer of heirloom addiction for me. Sliced and eaten raw with basil, topped on salads, added to pizzas and frittatas, and here: generously sprinkled on tostadas. Tostadas are also a new recipe for me. 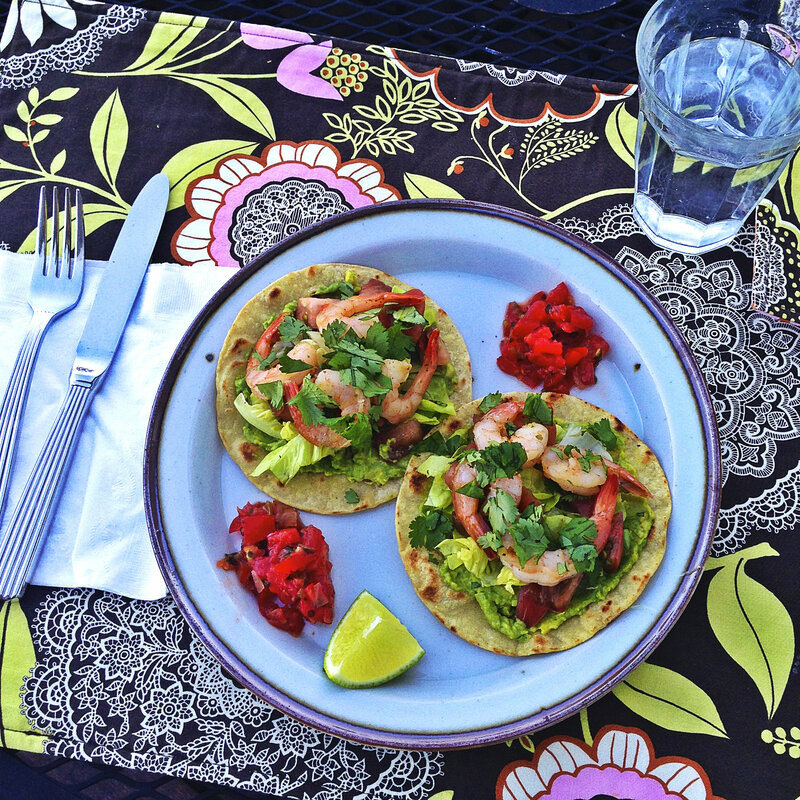 I am a huge fan of tacos – so many fresh ingredients and options for vegans, pescetarians, and meat-eaters alike. Plus gluten-free friendly! Tostadas provide the same base for all those wonderful ingredients, but even more of the filling – and with an added crunch. It seemed like a perfect way to get even more avocado-wonderfulness in each bite. And it is! Be generous with those toppings – they are worth it. One of my favorite memories of childhood summers is Popsicle Joe. My friends and I would be swimming in the lake, and the moment we heard the jingle of the ice cream truck, away we swam and ran down the dock. We would stand in the quickly forming line in our tankinis and bare feet, hopping on the burning hot cement of the parking lot with our quarters, internally debating which ice cream treat we’d have today. Back then, I could eat as much as a teenage boy, and I would have survived solely on ice cream and candy if my parents had allowed it (now I suppose I can appreciate that they fortunately instilled healthy habits at a very early age). Needless to say, I no longer gorge myself on dairy-rich “choco-tacos” but I do still crave those sweet frozen treats, particularly in this heat wave summer in Seattle. I have tried just about every ice cream alternative at Whole Foods, and although I’m impressed with the variety of coconut, almond, and soy based alternatives, there’s really nothing nutritious about them, and they’re often still loaded with extra sugar and random ingredients (bean gum?). So I set out on a mission to make my own ice-cream alternative, that could rival Popsicle Joe’s goodies. Crazy, I know. Pinterest is always my starting place, and there I discovered a couple of trends: 1. “nice” cream, which is a banana-based ice cream, and 2. avocado pudding. Based on these inspirations, I combined the avocado and banana to make something extra creamy, with just enough sweetness and chocolate-goodness to make it a real treat. But that seemed a little too plain, and when I remembered I used to love mint chocolate chip ice cream, I decided to add fresh mint to the mix, and top the whole thing with fresh strawberries. I was skeptical that simply using veggies, herbs, and fruit to make this frozen treat would rival the real-thing, but I was gleefully surprised at the outcome. If you don’t believe me, here is a quote from my Ben&Jerry’s-addicted boyfriend after eating my creation: “It makes you feel like the dairy companies have been lying to you”. Ha! Big victory for my inner-ice-cream-loving-child. Bonus: with the wholesome combo of ingredients, this frozen parfait is packed with nutrients, fiber, antioxidants, healthy fats, and even protein! Hopefully by now I’ve convinced you to try this, so enjoy! This is definitely the longest break I’ve had between blog posts, mostly due to travel. Lucky me got to go to a psychology conference in Berlin and then a family reunion in the Outer Banks. Both trips were beyond wonderful, and involved some very delicious food, but I definitely missed cooking for myself. I realized how much I value the freedom of having my own kitchen and all the variety that comes with living a few blocks from Whole Foods and a fully stocked pantry. I also missed the experimentation in trying new recipes for myself (and my boyfriend, who fortunately devours both my wins and losses). Over the past few weeks, I have been thinking of a multitude of recipe ideas, but the stuffed eggplant dish was at the top of my list. I’ve already made it twice, and so far it has been given the seal of approval! It has been gorgeous in Seattle since being back, and although I often just eat raw veggies and cold foods in the summertime, sometimes I still crave something more comforting and hearty for dinner. As a “flexitarian”, I am often thinking of vegetarian dishes that can be served alone or with meat. Eggplant is a great option for vegetarians due to its meaty texture and smoky flavor (not to mention it’s high protein and fiber content). I hardly ever cook it, but it seemed like the perfect base for a variety of Mediterranean flavors. It combines the summery fresh flavors of tomato and basil, with the crunch from the almonds and the saltiness of feta and kalamata olives. Each bite packs a ton of flavor, and nutrition. This dish is great on its own as a light meal (add garbanzo beans for more protein), or as I served it, with roasted chicken and a simple green salad. If the “stuffing” part seems difficult, you could also just dice and roast the eggplant, combine the other ingredients, and just mix together as a salad! In any form, it’s a perfect meal for entertaining, or for a simple night in for two! There are some things in my life that I just like to be consistent and routine – maybe comfortable is the right word. When my life feels go-go-go, it’s nice to have some constants to rely on. Breakfast is one of those for me. As creative as I get with my lunches and dinners, I pretty much eat the same thing every morning, and in the same routine. My typical breakfast consists of either oatmeal or yogurt with walnuts and fresh berries, and hot jasmine green tea. I am one of those strange people who wakes up hungry, so I either have to eat right away or right after my barre class or jog. I truly look forward to my usual little breakfast, which I eat at my desk as I read over emails or the latest health & science news in the NYtimes. It’s just so comforting. But lately I decided that maybe it’s time to mix it up a little. I didn’t want to stray too far from my go-to breakfast, but agreed maybe I could replace my oatmeal, nut, fruit combo with something a little more exciting and hearty. So I thought of everything I’d ideally eat with breakfast, and came up with the recipe below: a blend of my favorite nuts, seeds, fruits, and spices in one simple cereal. And I can even eat it with my yogurt! It has now become my favorite breakfast, but also dessert. It’s equally delicious with ice cream, yogurt, milk, or simply by itself. If you prefer a more chunky granola, it’s easy enough to do by forming larger pieces on the baking pans, and not stirring so much. I’ve also heard adding egg whites to the mixture helps it clump together. But I prefer my granola like this, so that I can taste every flavor individually, and so that sprinkles nicely over my little bowl of yogurt. This granola combines so many powerfoods into one: oats, pepitas, almonds, flax seeds, goji berries, coconut, and cranberries. You are welcome to substitute out different nuts/seeds/dried fruit that you have on hand, but I highly encourage you to keep a wide variety because the textures and flavors balance each other out very well. This combination also provides an excellent serving of protein, fiber, antioxidants, omega-3s, healthy fats, amino acids, and various other vitamins and nutrients. If you haven’t tried goji berries yet, you should – they are spendy but worth it! They have more antioxidants and vitamin C than any other fruit, and they are said not only to be a superfood for your health but also your brain power and energy. Interestingly, they are in the same family as tomatoes and eggplant! But don’t worry – they taste more like a cross between a dried cranberry and strawberry – so yummy. All in all, this granola mix has a nice balance of salty and sweet, with just enough crunchiness and chewiness in every bite! When I received a food processor a few Christmases ago, I never realized just how much I’d use it. I have far too many appliances for my tiny kitchen, and a few too many collecting dust, but my food processor may as well live on my countertop. There just seem to be endless uses for it – homemade nut butters, hummus, raw cookie dough bites, and pesto- so much pesto. Just like my food processor, there are so many ways to use pesto, and countless versions. 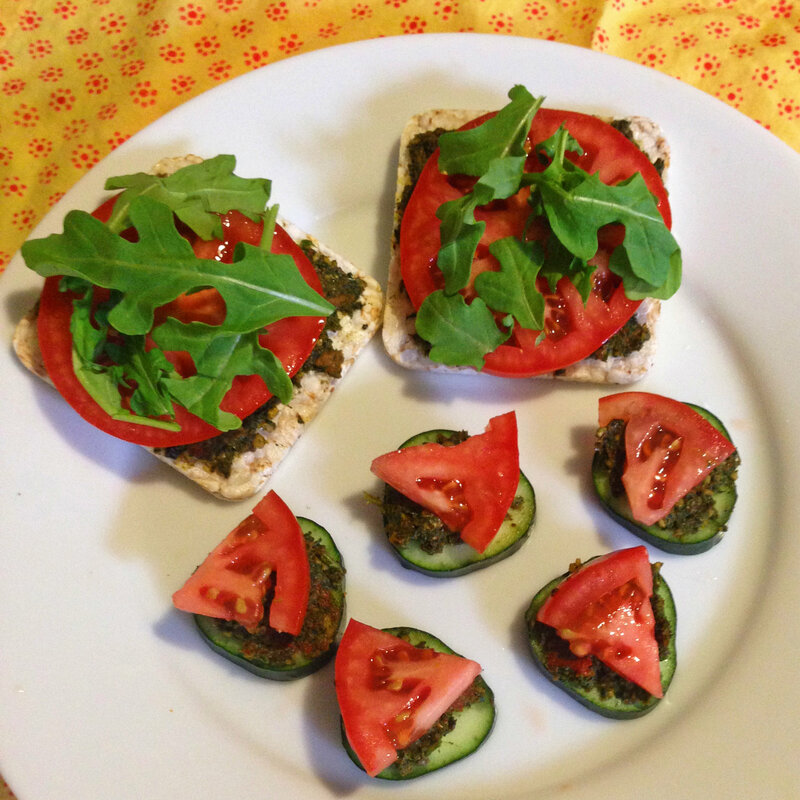 Although I still frequently go back to my avocado pesto, this is definitely a new favorite- somewhat a blend of tapenade, bruschetta, and pesto. Instead of using this as a pasta sauce, I like it best spread on crackers or cucumber, with fresh tomato, basil, or arugula. This pesto is hearty and flavorful, but without the cheese. I used a combination of kale, basil, sunflower seeds, kalamata olives, sun-dried tomatoes, lemon, and olive oil to create a tangy but earthy taste and texture. This was first inspired by a spread I saw on an a burger from the Oh She Glows cookbook, but I made my variation with a bit more substance and flavor, so it can stand on its own as an appetizer or light meal. A perfect classy but healthy addition to your next dinner party or just a lovely snack to enjoy in the afternoon sun! So I’ll admit, I’m a bit of a quinoa addict. 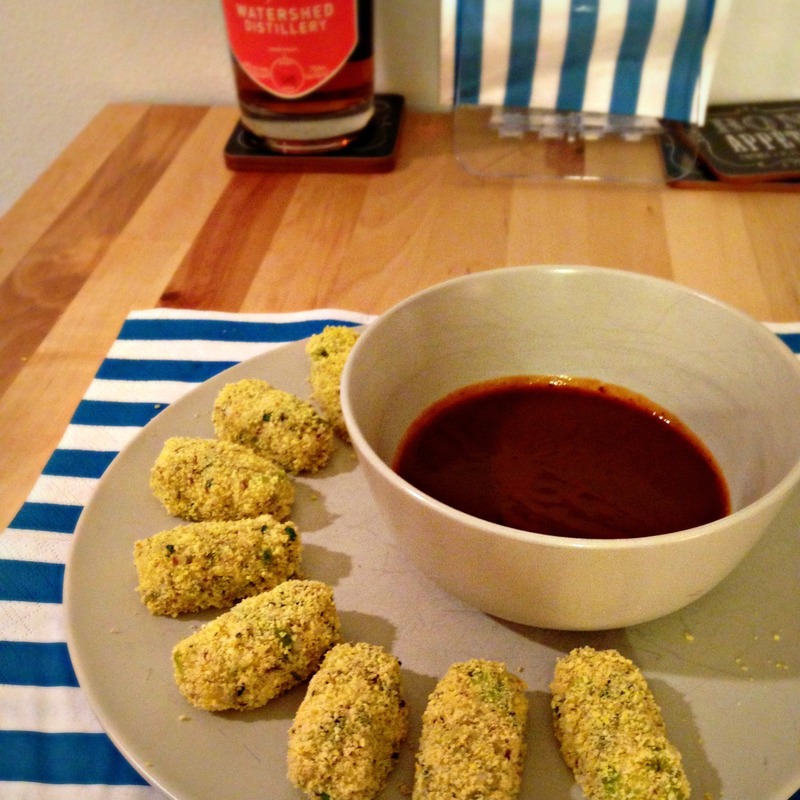 It does tend to be a common theme on this blog, but it is just so delicious and versatile! I am especially inspired to whip up some quinoa in the summertime, when I’m craving a fresh but wholesome meal that can be enjoyed outdoors. The past couple of weeks have been gorgeous in Seattle, and my weekends have been filled with BBQs and potlucks, which makes me oh-so-happy. Life doesn’t get much better than enjoying good company, soaking in the last couple of hours of sun with the aromas of the grill going, and chowing down on refreshing salads, fruits, and beverages. 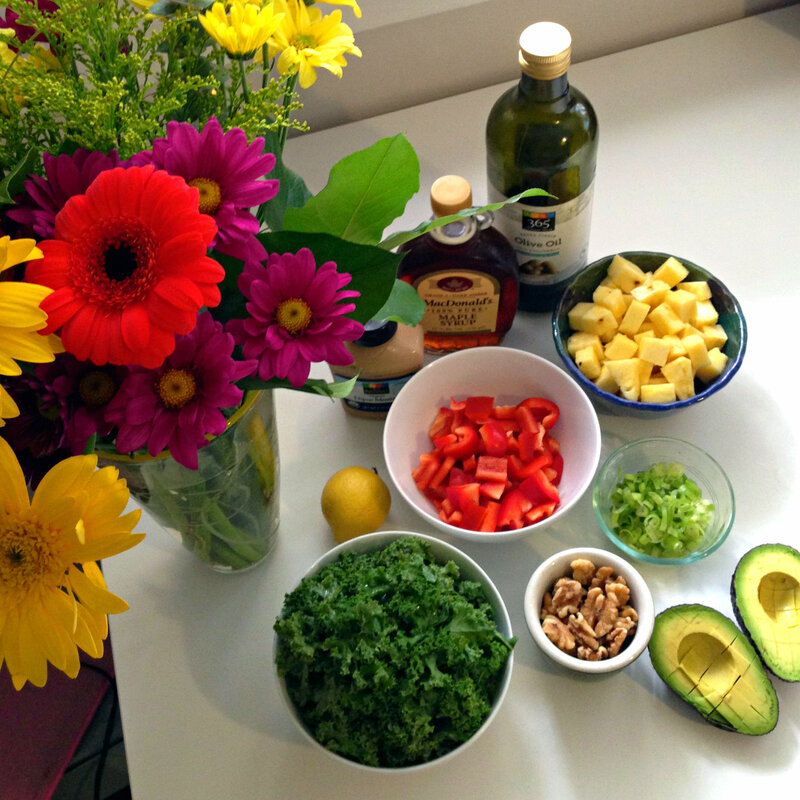 Quinoa salads are my go-to for potlucks and picnics, and this recipe is my new favorite. I can (almost) promise you that if you bring this to your next outdoor party, you will make friends. Although I love to experiment with different types of flours and gluten-free alternatives, I also like to keep my recipes simple. These cookies don’t have flour at all- again, giving it the super rich chocolate taste. They also don’t have any butter or oil, and only contain the whites of eggs. Instead, the heartiness is provided from the healthy fats of the walnuts, or whatever nut you choose to use. Not only do these have the savory touch of salt, but also the aromatic spices of ginger, cinnamon, and nutmeg, which actually only add a subtle flavor over the rich chocolate/walnut taste. The end product: a gooey, brownie-like, crunchy, decadent chocolate cookie. Hope all you chocolate addicts get as much joy from these as I do! As a true Seattleite should, I truly love seafood, and in particular, salmon. Whether it’s raw in sushi, smoked and tossed in an omelet, or simply grilled, I am obsessed all the same. Despite this passion for salmon, and the ridiculous number of times I’ve ordered it out at restaurants, I hardly ever cook it myself. So this was my latest challenge- to find a new and creative way to make a delicious salmon dish in my own little kitchen. With the sun peeking out lately, and the smell of dinners on the grill as I walk through my neighborhood, I have been feeling more than ready for summer. I’m looking forward to BBQs, picnics, and dinners out on my parents’ deck, enjoying a a simple summer meal. My mom and I have a favorite when it’s just us- crabcakes from Metropolitan Market, sweet potato, a simple green salad, and a crisp glass of white wine. But why wait til summer? 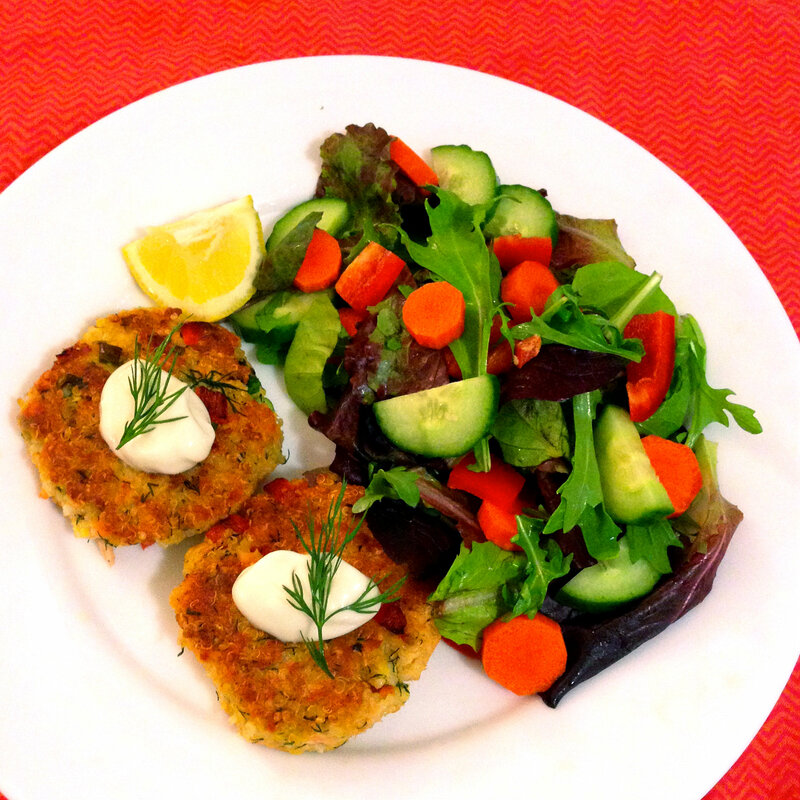 And who needs premade crabcakes when you could have fancy homemade salmon cakes? I am a firm believer in the 5-6 smaller meals a day, mostly because it allows me to eat snacks- my favorite food group. Well, I suppose my typical dinner isn’t really a “small” meal, so maybe I just divide my breakfast and lunch into 2 small meals each. Whichever way it is, I like to eat, and I like to eat frequently, and thankfully I also like to workout to compensate…but anyway, back to snacks. I am constantly looking for savory snacks that aren’t just my usual handful of nuts or crackers and hummus. Whole Foods has some great snack options in the bulk aisle, including one of my favorites- veggie chips. But they are so expensive and often broken into tiny pieces which is quite irritating! So I decided to try to make my own veggie chips, without any of the tools I had once deemed necessary, namely a mandolin slicer and a dehydrator. Instead, I just used my new fancy knife and my good old tiny apartment-sized oven. These chips took a few tries to get the right crisp, and still, I can’t say they are like the veggie chips you buy at the store. They are still a bit chewy, and don’t stay crispy once cooled or stored away, but they are delicious fresh out of the oven and also more flavorful and reminiscent of the true vegetable you are consuming(which I consider a bonus). When reading my instructions, keep in mind that your results may differ based on the thinness and evenness of your slices, as well as your oven’s personality (They all have one). Ideally I will soon purchase a mandolin and dehydrator, but for now, I am pretty happy with this version! 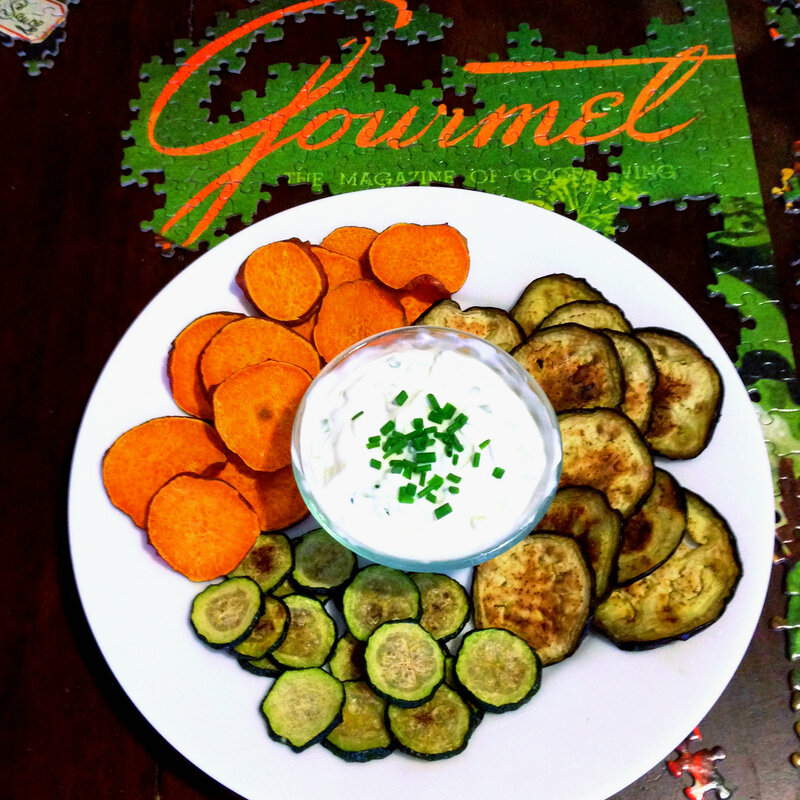 I decided to go with a Greek theme, and make eggplant and zucchini chips with a tzatziki-type of dip. But then I also had to add in sweet potato, because if you follow my blog, you know how in love with them I am. I baked each of the vegetables separately, since they all have a pretty different consistency and texture. I encourage you to try out other veggies as well- carrots, potatoes, parsnips, other squashes- the possibilities are endless. The only seasoning used here is salt, because of the accompanying dip, but you could experiment with a savory garlic/herb combo, or a sweet cinnamon sprinkling. However, in my opinion, simple is good, and with the strong flavors of the veggies, the tangy and refreshing chives, cucumber, lemon, and yogurt blend is a perfect balance. It’s that time of year in Seattle when we all get excited because it is “Spring!”, but the weather is as Wintery as ever. The past week has been sporadic breaks of sun amidst long-lasting, cold rainfall. This may be great for the spring flowers, but really not helped the cold I’ve been fighting for the past couple of weeks. Although my short weekend in the sunny SW improved my symptoms, they automatically returned back in the PNW rain. But luckily, food is the best medicine, and with some special Yogi tea and a few of these superpower lemon bites, I’m feeling almost as healthy as I would laying by the pool in 80 degree weather…almost. 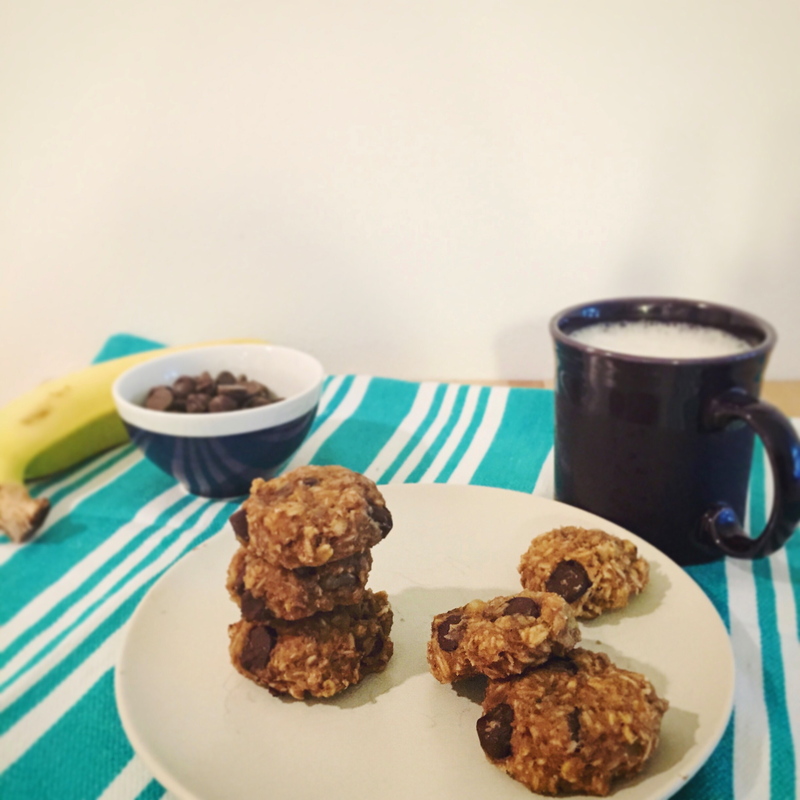 These little cookie bites have a ton of nutrients for their size, as well as immune-boosting properties! Both lemon and honey soothe cold and sore throat symptoms, and along with coconut, are beneficial for the tummy too. I used lemon zest instead of lemon juice in this recipe, both for the added flavor and the added nutrients- turns out lemon zest has several times more vitamins than the juice. The cashews give this treat a bit more substance and protein, and the vanilla adds the extra hint of sweetness. The result of it all- a refreshingly rich, tart, and naturally sweet burst of flavor. Whether or not you’re feeling under the weather, or are currently experiencing downpours, these are awesome snacks.. They’re the perfect bite when you need a little pick-me-up in the middle of the day, or a bit of something sweet after a meal. I can’t say they are completely guiltless, but each ball packs less than 70 calories and only 3 grams of sugar! As most raw cookies, they are best stored in the refrigerator or freezer to keep the firmness and texture just right. And rolling them in the extra coconut just gives it an even nicer texture, and wonderful coconut taste. So enjoy! Wraps have always been one of my favorite lunches- so many varieties of fillings, and easy to roll up and pack for school/work. However, I’ve never really gotten too creative with the actual wrap, besides maybe the flavor or “wheatiness” of my tortilla. 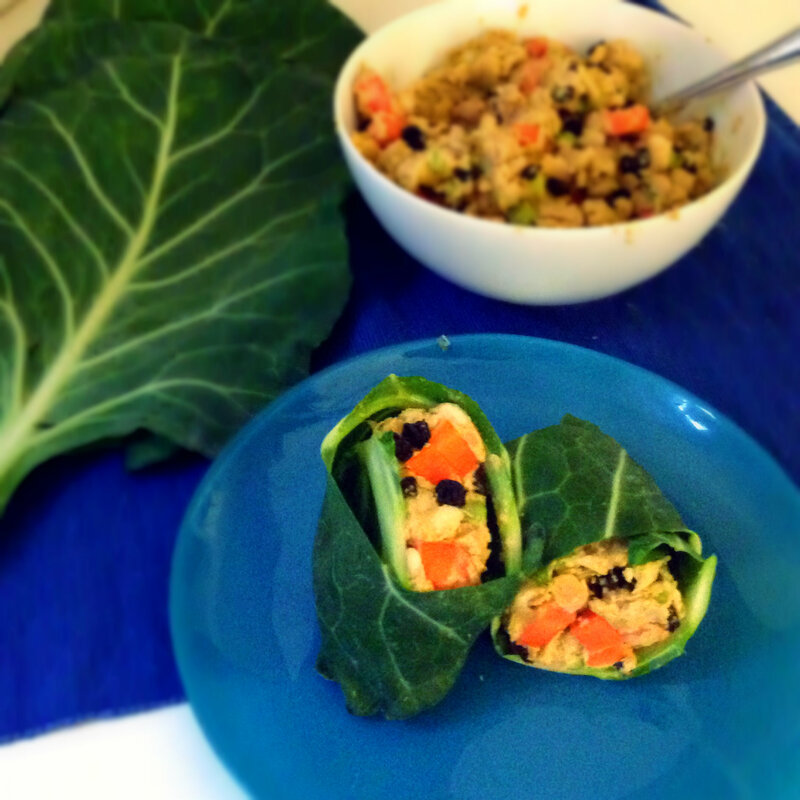 Thanks to Instagram, my new food browsing addiction, I came up with the idea of making a collard greens wrap! Since I created my Instagram account for this blog (username: cloudthyme), I’ve been not only posting my own recipe photos, but also random food experiments in the kitchen, or delicious meals when I eat out. Furthermore, I’ve been able to get a lot of great inspiration from fellow instagrammers and bloggers who post ridiculously gorgeous and creative food pictures and recipes. But Pinterest, I still love you too! Anyway, once I decided I was going to try a wrap using collard greens, I had to think of some kind of flavorful filling to balance out the fresh but slightly bitter taste of the greens. Since I have really never experimented with curries, I decided to give a vegan curry salad a try. I am a big fan of the chicken curry at Whole Foods, because it is only spicy in the sweet kind of way, and that is what I went for here. The chickpea, cashew, and tahini base gives the curry its hearty, creamy consistency and the veggies give the wrap the crunch and freshness. I added currants to make this curry even sweeter, and it goes so well with the curry and ginger spices. Lately I have been trying to add more spices and fresh herbs instead of salt, and this is a perfect example of a dish that hardly needs any salt added. There is enough flavor and spice in itself, especially with the tahini and fresh ginger. If you like your curry even spicier, feel free to amp it up with cayenne or hot peppers. Once I learned a couple of tips, I was surprised at how easy it turned out to be to wrap this curry up into a collard green. First, you want to make sure your curry is thick, so if it is too runny, add more chickpeas and mix together well. As you will see in the recipe, I blended most of the chickpeas and cashews first, but then kept some whole to make the curry more chunky and textured. The other big tip is to trim down the stem of the collard green. This blog has a great photo-by-photo instructions for how to do this (although I didn’t even soak the leaves). Basically, you just cut off the end of the stem and then carefully shave down the stem along the center of the leaf until it is flush (or close to) with the leaf. This prevents the leaf from splitting as your roll it up like a burrito around your curry filling. Baking definitely involves quite a bit of experimenting and chemistry. When creating new recipes, I can often post my savory dishes after one try, but with baking, it takes me at least a couple before it’s a dessert that I want to eat over and over again (and thus share online). Although let’s be honest- I tend to demolish my “fails” pretty quickly too. 🙂 So as per usual, this was my 2nd take on this cookie, but I’m so glad I found the right scientific combo because this may be my new favorite go-to cookie! These are kind of like trail mix on crack- all the deliciousness of Gorp rolled into a delectable cookie. (Side note: Is my family the only one to call trail mix “Gorp”? Or is this a Seattle thing or a Girl Scout thing? 2nd side note: I didn’t know until my adult life that it stood for “good old raisins and peanuts”. 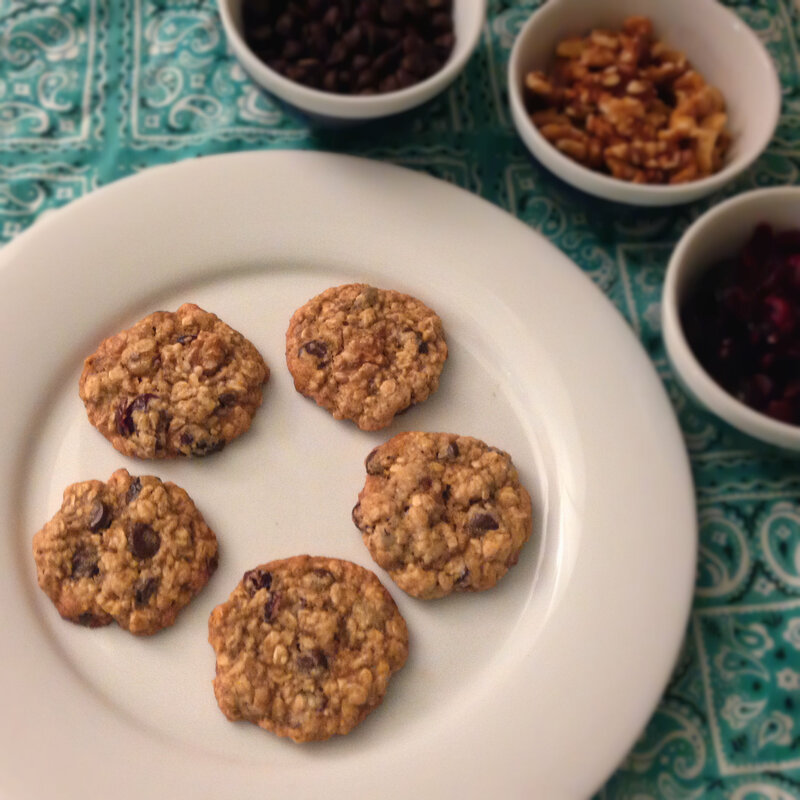 So maybe this isn’t Gorp…) Anyway- I was also very excited to make a vegan/gluten-free/soy-free cookie that tastes so delicious and “normal”- the texture is just like my favorite childhood oatmeal cookies- chewy and sweet with the added crunchiness of the CCW (my replacement for Gorp here). As you will see in the recipe directions, I highly encourage eating the dough as you go along. There are no eggs, so those of you who are typically cookie-dough-phobic, here is your chance! I based the number of cookies made (30) on my first batch (in which I shockingly abstained from eating the dough) and also this time based on subtracting the spoonfuls I ate during the process. 😉 You could definitely substitute other dried fruit and nuts here if you have certain preferences or ones on hand. Also feel free to make these cookies larger, I just make them small so I feel slightly less guilty when I eat 3 at a time. Also easier to share this way! That’s all for now…Enjoy your new science experiment! Most of my meals in the winter are cooked- I crave the warm, comforting foods like roasted veggies and soups. 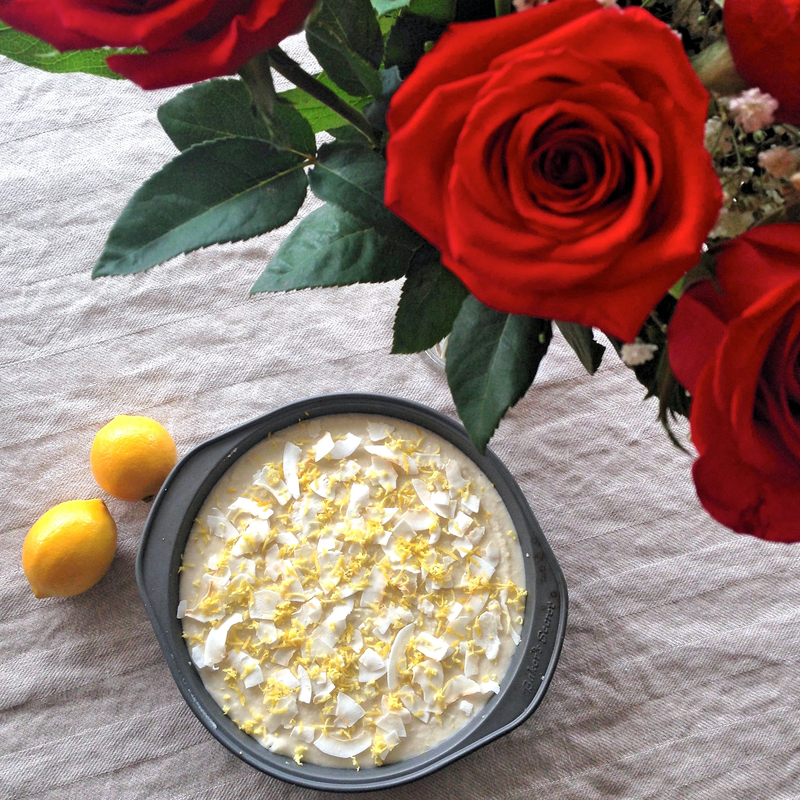 But sometimes these cold, rainy days call for something bright and fresh, to contrast the dreary weather. And other times, there just isn’t enough time to wait for the oven or stove. Last weekend was a crazy busy one (and a rainy one, of course), so both the weather and time constraint inspired me to make something wintery fresh. I also find that when my life (typically school) is especially stressful, a delicious meal is just the right thing to take the edge off. When I walked into Whole Foods, and knew I only had a few minutes, I did what I always do: look for whatever’s on sale in the produce section. This weekend, I saw avocados (yay!) and tangelos (new!). I have only eaten tangelos a few times before, but for some reason they just taste so much better than the good old fashioned orange. So I bought a few of those, avocados galore, and then racked my brain for what else to add to my “wintery fresh” salad. Fennel seemed like the perfect winter vegetable for that extra crunch, and a combo of arugula and mixed greens for the base. 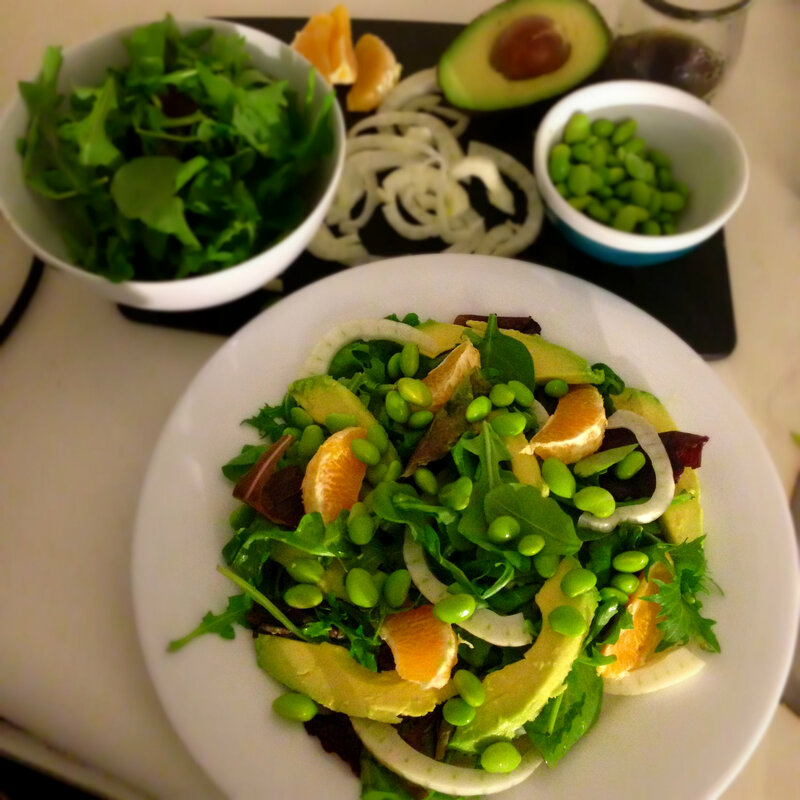 For a protein source, I already had edamame at home, so voila!, my quick meal was created in 3 minutes. This salad completely hit the spot, and was ready in 5 minutes. I tossed the greens with a homemade sesame-soy-vinegar dressing to add a savory note to the citrusy salad. You could also use a store-bought sesame salad dressing, but this was only 4 ingredients so I suggest you try it. I always make a fair amount of dressing, and then save it in small jars in my fridge to use for other salads and stir-fries. In this dressing, I combined sesame oil, rice vinegar, Bragg’s soy seasoning, and agave. You could definitely substitute normal soy sauce and honey or maple syrup too. If you haven’t tried Bragg’s though, I highly recommend- it has a distinct flavor that I actually prefer to soy sauce, it’s gluten-free, and has a whole slew of amino acids that your body needs. The whole salad is amazingly nutritious. All of the vegetables and fruits are loaded with vitamins and fiber, and the edamame has plenty of protein to keep you full for longer. (For detailed nutrition info, see nutrition fact chart at end of post). 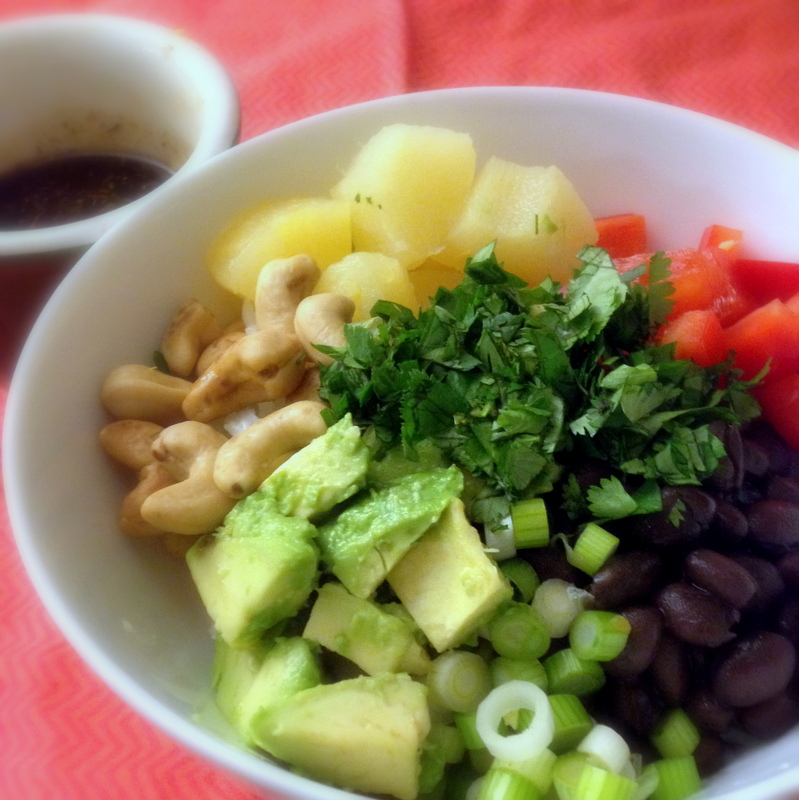 If you’re extra hungry, I would suggest doubling the edamame or adding another protein source such as chicken or tofu. As I’ve mentioned before, fennel is excellent for digestion, but also for your breath. So maybe save a piece of raw fennel to eat at the end of your meal too? 🙂 Anyway, here is the recipe, hope you enjoy! Some days (both healthy and sick) you just need chicken soup. Those days are pretty frequent for me in the winter, and I find myself lazily pulling a “healthy” pre-packaged box (why is all the organic/natural soup sold in boxes now?) from the shelf at WF more than I would like to admit. So recently I decided I needed to kick the habit and make something much more delicious, hearty, and wholesome than the store-bought, preservative-filled kind. This creation completely converted me to homemade soup and was way easier than I had anticipated- even without a dutch oven! The best part about making soup or stews is that you can pretty much ad-lib in any way you please. It was actually hard for me to think about measurements while making this for the blog, because the first couple of times I made it I just threw in however much of each ingredient I wanted (aka super heavy on the squash and herbs). But if you like to follow directions to a tee, what you see listed below should work out excellently. Also, if you’re like me, and have little meat-cooking experience, it is pretty much impossible to go wrong cooking this chicken. Due to the fact that it cooks in broth and with so many flavors, it can’t dry out or taste bland. Win-win! So for this Valentine’s Day, or any day really, here is a sugary treat for you all to enjoy (equally delicious alone or with your valentine)! I knew that I wanted to with a pink theme, but in the dead of winter, was especially inspired to do something completely out of season- pink lemonade! I added just enough fresh lemon juice and zest to give this cookie a bit of a zing, but not enough to overpower the sweetness of the cane sugar and vanilla. To get the pink color, I used good-old-fashioned red food coloring, but if you are more granola than me, I highly recommend trying making your own from beets! Here are instructions for that. 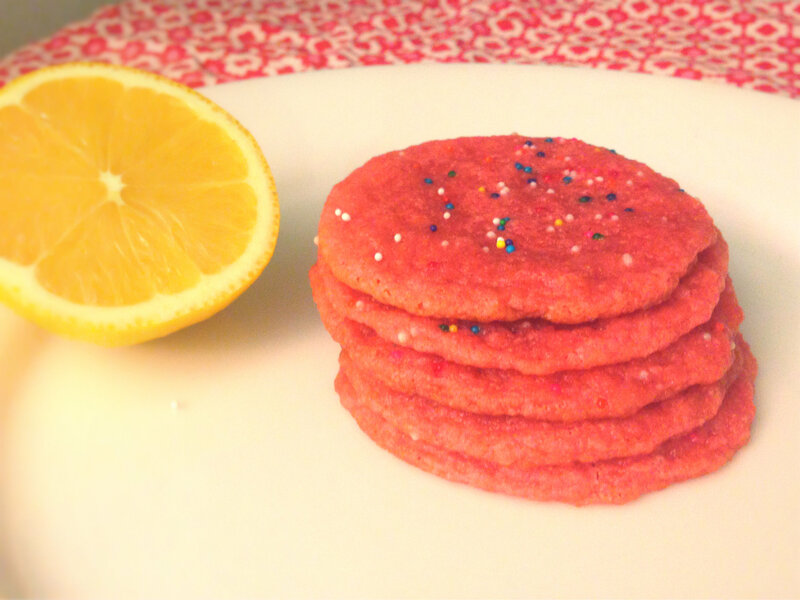 These pink lemonade cookies were some of the easiest baked goods I’ve ever made, and oh-so chewy and buttery. But there’s actually no butter in this cookie! There is actually no dairy, egg, or gluten at all, and you would never know it. These are made with soy butter and the extra indulgent addition of soy cream cheese. I used Bob’s Red Mill GF all-purpose flour (made from garbanzo beans), but you could use any type of general flour here, as well as dairy products in equal proportions to what I used in these vegan/GF version. Whatever your dietary preference, be sure to top with rainbow sprinkles! Side note: I was recently at Starbucks and overheard the best order: “I would like a grande salted caramel mocha with extra fun please” aka she wanted more sprinkles…amazing! A girl after my own heart. 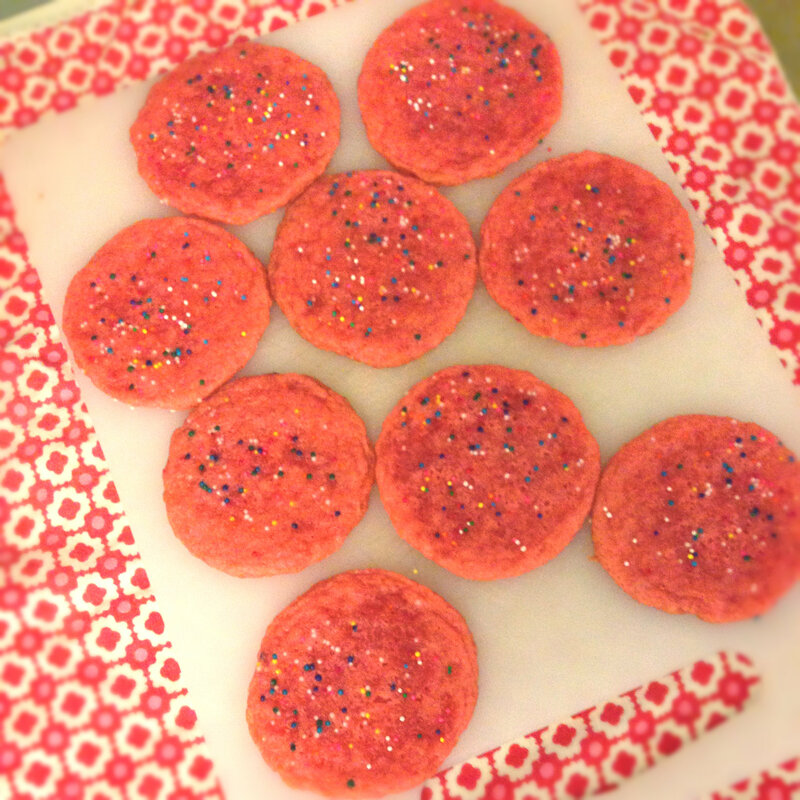 So I hope these cookies provide the extra fun you need to get through this wonderful (or awful) sugar-high holiday! I have been wanting to try out a new kind of flavor, that I’m not as familiar with in my own cooking or even going out to restaurants. There is no shortage of amazing places to eat and try new foods in Seattle, particularly when it comes to New American, Asian, and even many European cuisines. However, one deficit in the area, at least in my exploration (which is quite vast in my foodie life) is in the Caribbean/Jamaican genre…thus resulting in this adventure of creating a giant and flavor-blasted Caribbean Jerk Bowl! *Note: the psychologist in me wonders if in my subconscious, I was inspired to make this dish based on the movie Cool Runnings. After all, it is the Winter Olympics right now and my favorite relevant movie is about the Jamaican bobsled team…I’m just saying, may have been a factor here. Anyway! 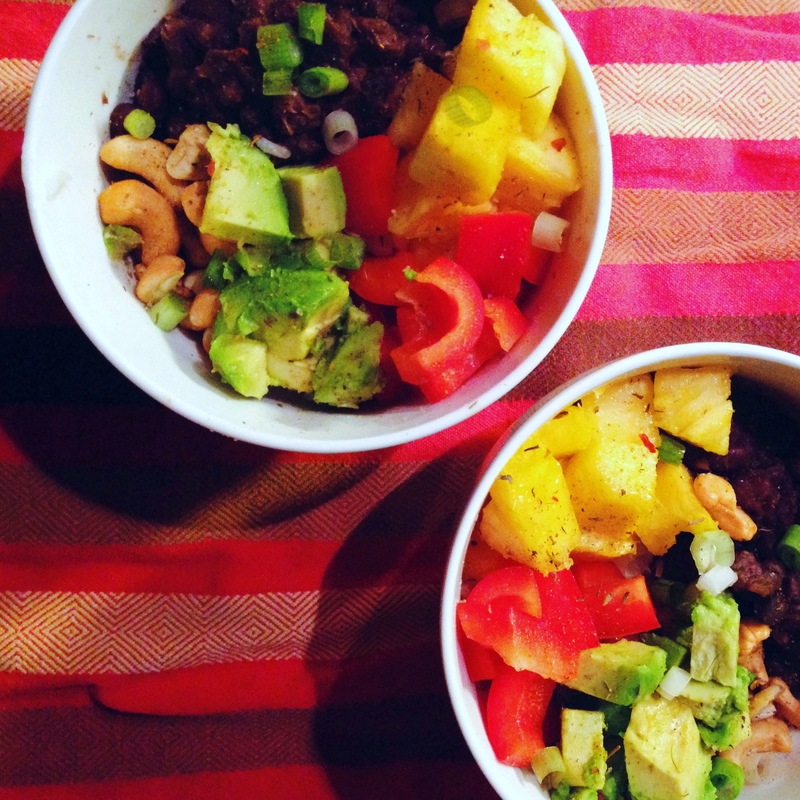 This bowl may be vegan, but it is packed full of hearty ingredients like coconut rice, black beans, avocado, and cashews. Yet the freshness and tang of the pineapple, bell pepper, scallions, and cilantro make it taste light and comforting at the same time. You can choose to keep the presentation as so, or mix it all together, but either way every bite is a little bit different, with a mix of crunchy and creamy; spicy and sweet. Now when I say spicy, I don’t mean spicy hot, but rather an earthy, Caribbean spicy made from a combination of allspice, thyme, coriander, cinnamon, garlic, and ginger. The first time I made these bowls, I kept the spices dry, but then realized the flavors would spread better with a sauce. So I combined those spices with a mixture inspired by a jerk-style marinade. The result: a burst of spice without the fire-in-your-mouth. If that’s your thing though, just go crazy with some cayenne or chili pepper. My first green thought was my favorite hummus from Oh She Glows. 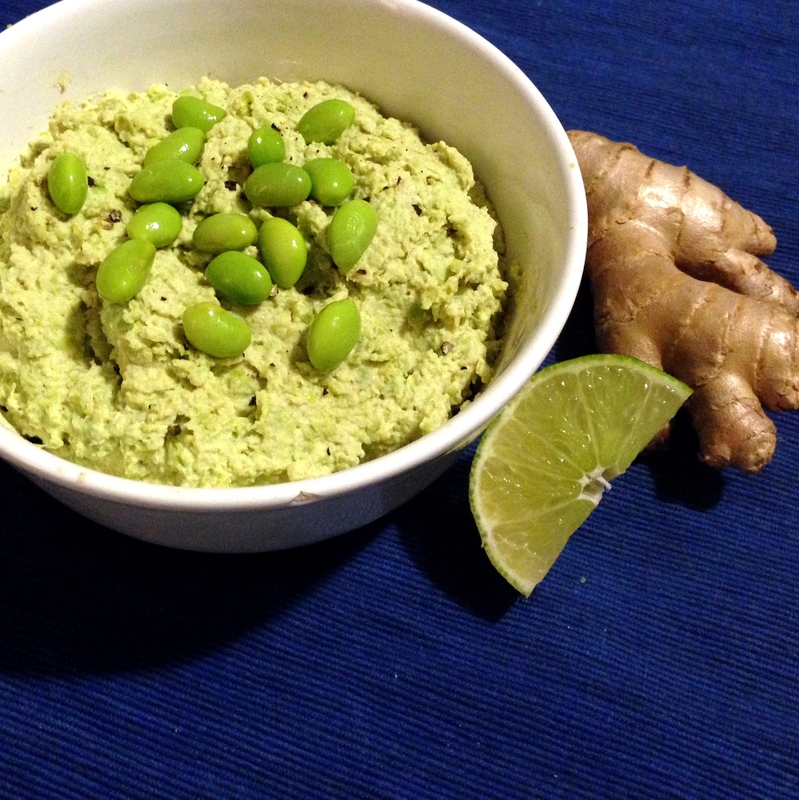 I used her recipe as an inspiration and adapted it into a ginger-lime edamame dip. This “hummus” has no actual chickpeas or beans except for edamame/soybeans. What it does have is tahini and an abundance of spices and herbs that leave you with a zingy, summery taste that is refreshingly light compared to the usual this time of year. The fresh ginger and lime juice is key, as well as fresh garlic. For spices I added cumin and coriander (powdered) but since it’s all processed you could use whole seeds as well. Although these are strong spices, due to the ginger and lime, they don’t overpower. And most importantly, the dip remains a beautiful bright green color! As you will see below, I have added a new “nutrition fact” box for this recipe. I am planning to include this in all my recipes now. Although I don’t believe in calorie counting, it is useful to see the protein/fiber/vitamins/carbs/sugar if you are trying to add or control for those types of things. As you can see in this recipe for instance, just 1/4 cup serving is almost 9 grams of protein- pretty impressive for a green dip! 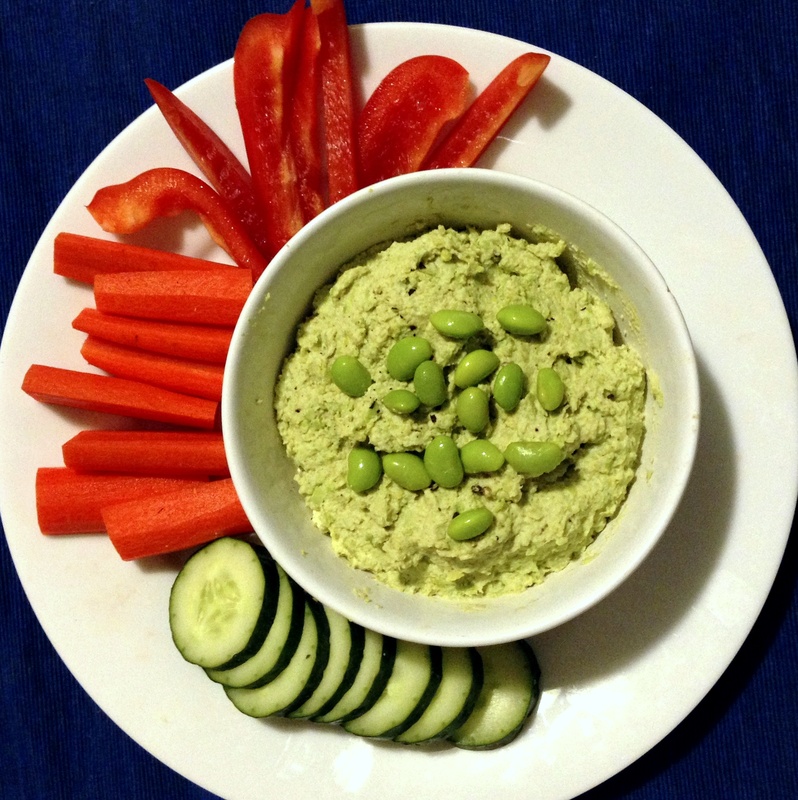 Edamame is definitely a powerhouse when it comes to protein, fiber, and folic acid. I’m not a big tofu fan, but pure soy in this form is a great protein and nutrient source for vegetarians and carnivores alike. Now good luck only eating 1/4 cup! This dip is best served with fresh vegetables, such as cucumber, carrots, celery, or bell peppers. Due to its tanginess, it would also pair well with tortilla chips (maybe blue!) or pita chips. When I finally splurge and get a dehydrator, I’m going to eat these with homemade vege chips too… However you choose to eat this dip (spoon is totally acceptable), enjoy each flavor-bursting bite and GO SEAHAWKS!!! This recipe enabled me to finally use (almost) all my new Christmas kitchen toys! A new shiny green hand mixer, fancy knife, and napkins handmade by my mom and sister were all much appreciated today. 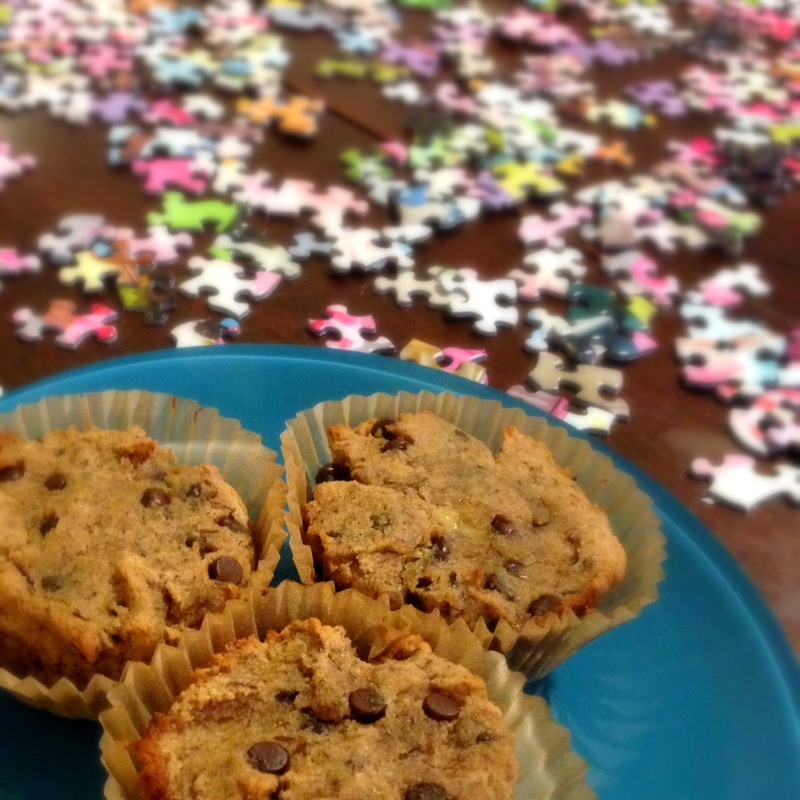 Not that I need extra motivation to cook, but my new toys definitely gave me an extra pep boost while baking. So this is just a shout-out to the wonderful members of my family who have all contributed immensely to my cooking career! I am a lucky girl. 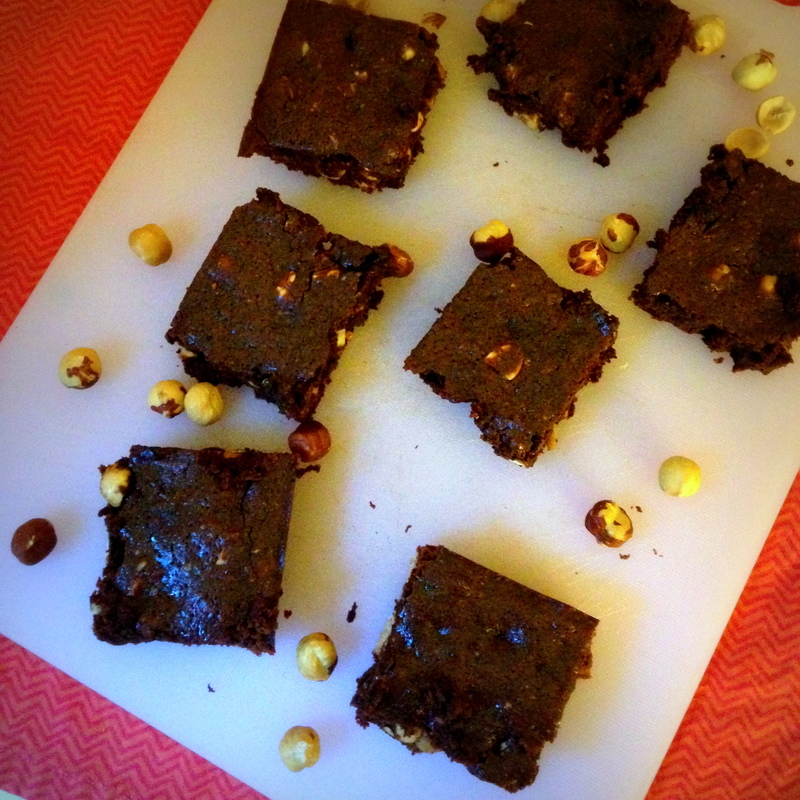 Now onto the recipe of the day…homemade nutella turned into dairy-free, gluten-free nutella brownies! These are incredibly indulgent tasting without the actual indulgent guilt. The first half of this recipe is dedicated to the making of the dairy-free nutella. Even Whole Foods doesn’t carry this, and I was just craving that rich chocolate-hazelnut taste. Turns out it’s super easy to make! Throw some hazelnuts, cocoa powder, agave, and a couple other little ingredients in a food processor and voila- delicious nutella. My nutella recipe was inspired by one of my favorite “healthy sugar high” blogs, Chocolate-Covered Katie. If you aren’t convinced yet, maybe the addition of hazelnuts will do the trick. Although there’s already hazelnuts in the nutella, I wanted the extra crunch in the brownies so added a whole cup of crushed hazelnuts to the mixture at the very end. These little nuts (and all other kinds) have been big talk in the health news as of late. The New York Times just published two articles last month to endorse snacking on nuts. Here’s one example. So here you go- this is your opportunity to have your cake and eat it too! Each brownie is only 130 calories. Healthy indulgences are the best. 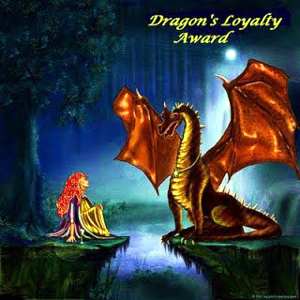 A big thank you to DeliciouslyNell of I Need a Feed for nominating me for the Dragon’s Loyalty Award! I am fairly new to the blogging world and appreciate this wonderful new network of fellow food- and health-lovers. Definitely check out the I Need a Feed blog for lots of delicious recipes! Share 7 things other bloggers may not know about you. There is never a time when I don’t have dark chocolate in my house. I need it to survive! Although I am pretty obsessed with my Barre workouts, and actually pretty good at it, I am an extremely uncoordinated person and frequently hit doorways when walking. I don’t own a car so I get a ton of exercise just from walking. My Jawbone UP tells me I walk an average of 5 miles a day! Before deciding on my Psychology Phd Career, when I was 8 I wanted to be a fashion designer and singer. (Note: I am a terrible singer and not extremely fashionable). I was once stuck on the Eiffel Tower elevator for over an hour. I was 12 and the only American! Now I have a fear of all elevators and am willing to walk up a ridiculous number of stairs. Not only have these bloggers been awesome supporters of my blog, but I am a huge fan of theirs! Happy Blogging Day! I only discovered my love of brussels sprouts a couple of years ago, and apparently right when they also became one of the “trendy” vegetables. 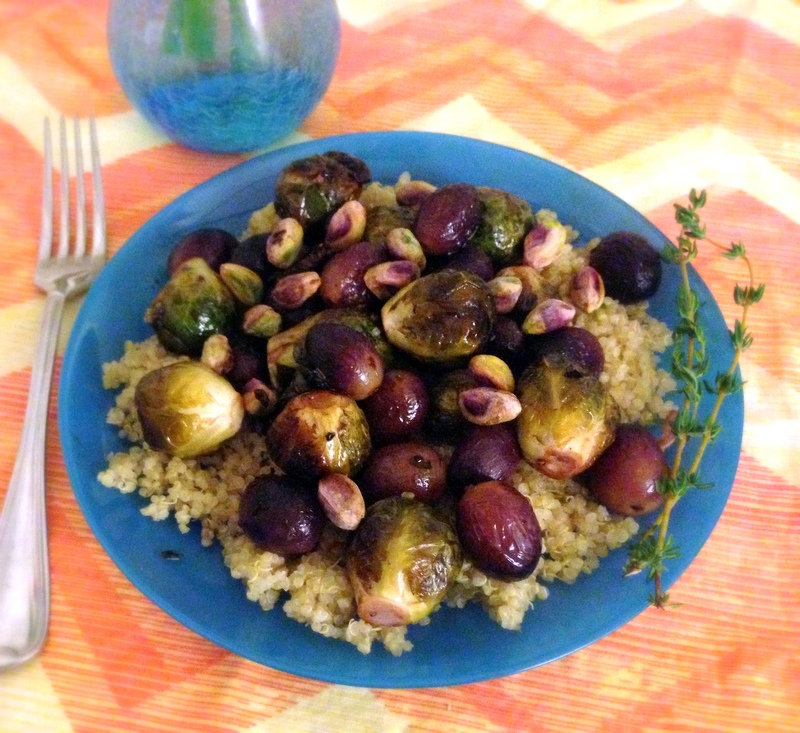 Brussels sprouts are all the rage right now on pinterest, right next to cauliflower…who would have guessed? Not only are brussels sprouts full of healthy fiber and nutrients, but they are relatively high in protein for a vegetable, and contain those powerful cancer-fighting antioxidants. Although a popular way to cook them is with butter and bacon, my lighter vegan method is just as delicious! I have been wanting to try roasting grapes since I saw this grilled bread recipe, and decided that the grapes would be a nice sweet pairing with the cruciferous vegetables. When roasted, grapes develop an even sweeter and softer taste but maintain their texture well. 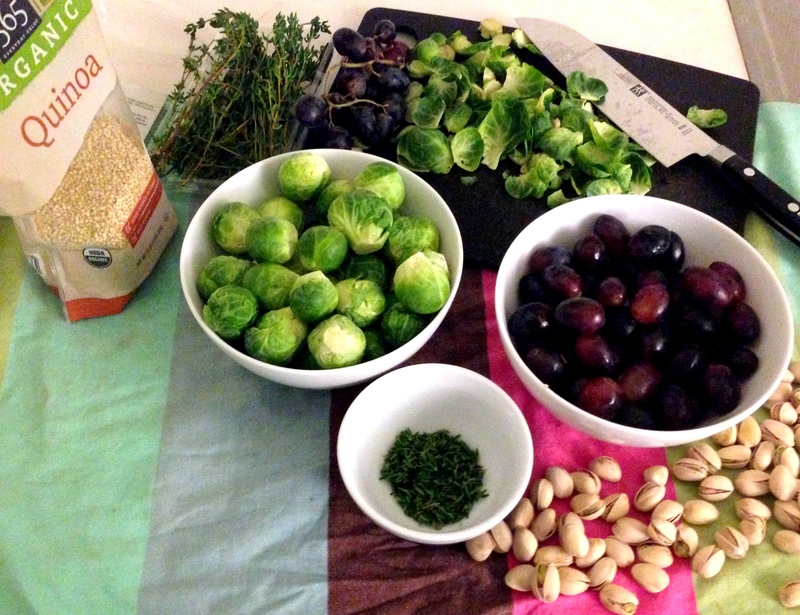 The earthy, winter flavor of fresh thyme compliments the sweet roasted grapes and savory brussels sprouts, but dried could be used as well. With the added crunchy, salty pistachios and the light but hearty quinoa, this is a satisfying but fresh dinner for these wintery and stormy nights! My primary form of exercise for the last year has been Barre- it’s an amazing full body workout and actually makes working out fun. For the first time in my life I have arm muscles and real abs! I am not just saying this to try to force my friends to do Barre with me, this is relevant to my energy bar recipe! 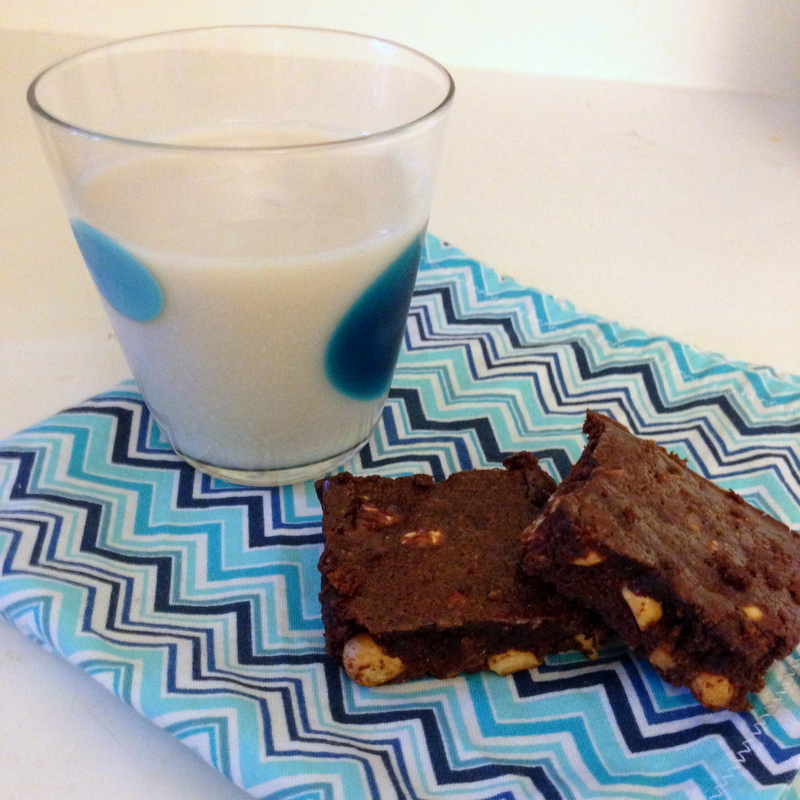 Sometimes I need a little pre-Barre fuel, or a well-deserved post-workout treat (or both…) but I have struggled in finding an energy bar that a) tastes good, b) doesn’t cost >$2 a bar, and c) doesn’t have a bunch of crap/unrecognizable ingredients. Although my cookie dough bites sometimes fit the bill, I wanted something higher in protein and a bit less sweet. For all those who care: these energy bars are raw, vegan, and grain-free. They are packed with healthy omega-3s, protein, fiber, and antioxidants- perfect to get me through a workout or satiate me after until my next meal. 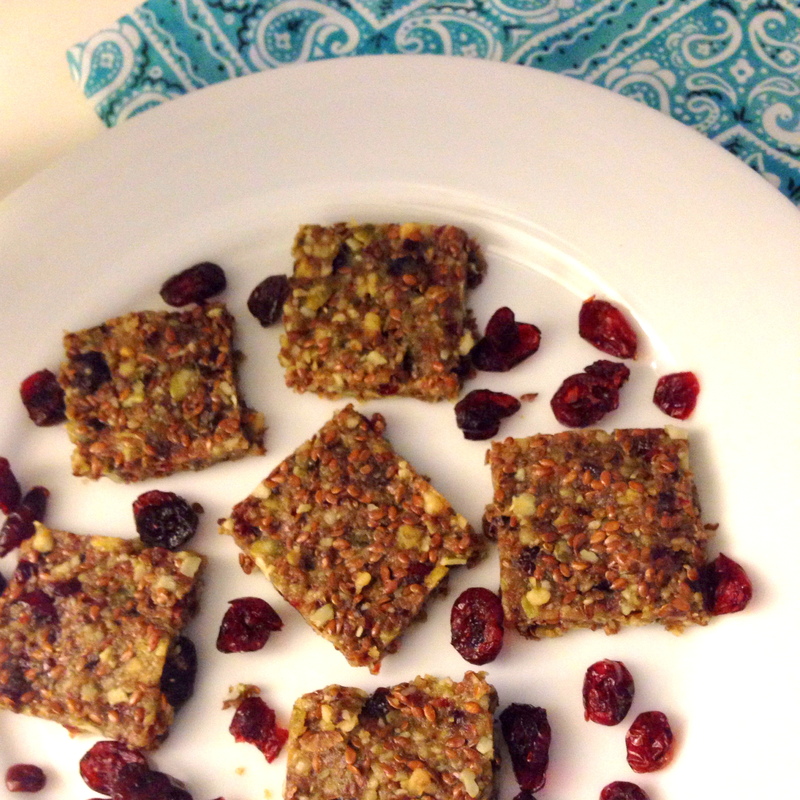 These take just 10 minutes to make and consist of only a few ingredients- such a simple little energy-filled snack! Note: The bars I made are very thin, but if you want a more typical bar shape, just double the recipe but use the same size pan. I have been on a serious pomegranate kick for the past few weeks. Although I’ve always liked pomegranates, it was only recently that I learned an “easy” way to de-seed a pomegranate, which is obviously super exciting. So now I will share my newfound knowledge with you: first cut off the top and bottom of the pomegranate, then use knife to lightly cut lines from the top to bottom, creating wedges on the surface. When you use your hands to peel away each wedge, there will be clusters of seeds exposed and easy to pick them off or brush into a bowl. Yay! You can see video describing this better than me too. It’s just so rewarding when you finally get them all! 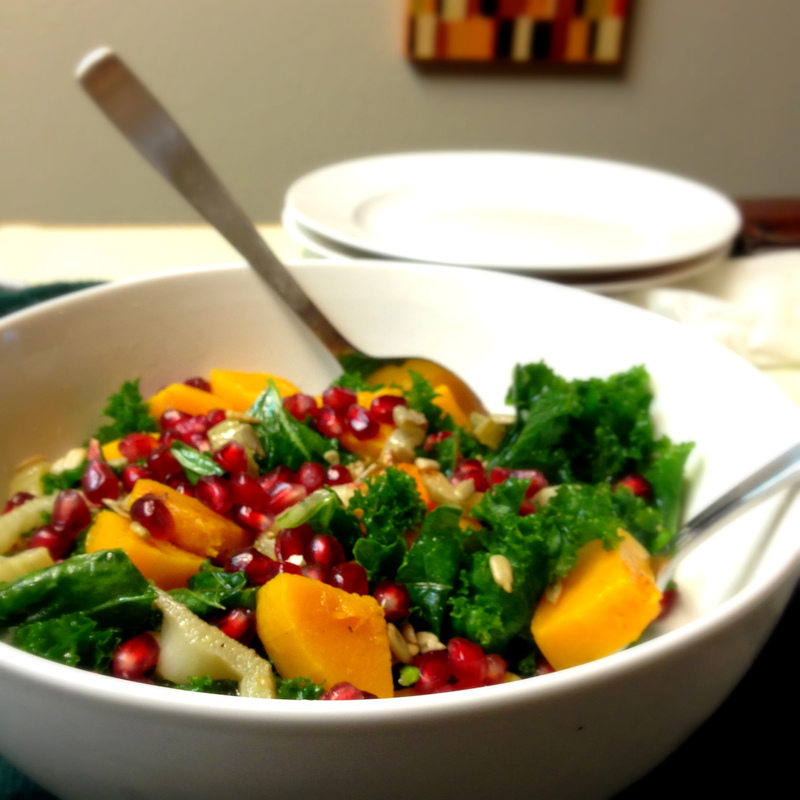 Although pomegranate seeds are delicious on their own, they are also the perfect addition to a superfood salad. I was about to go into all the nutritional advantages of pomegranates, but honestly all the ingredients in this salad are ridiculously good for you, so the list of total health benefits would be far too long! Even beyond nutrition, the combination of citrusy kale, sweet pomegrantes, crunchy sunflower seeds, buttery squash, and savory fennel is a refreshing dish in the winter. It doesn’t hurt that it looks a little Christmasy! I tend to use cooked kale in my dishes, whether it be soups or sautés, but I decided to give the raw kale “massage” technique a try. It is actually kind of fun to use your hands to massage the kale, and see the drastic difference it makes. The crispy bitter pieces quickly begin to wilt, soften, shrink, and mellow in flavor. 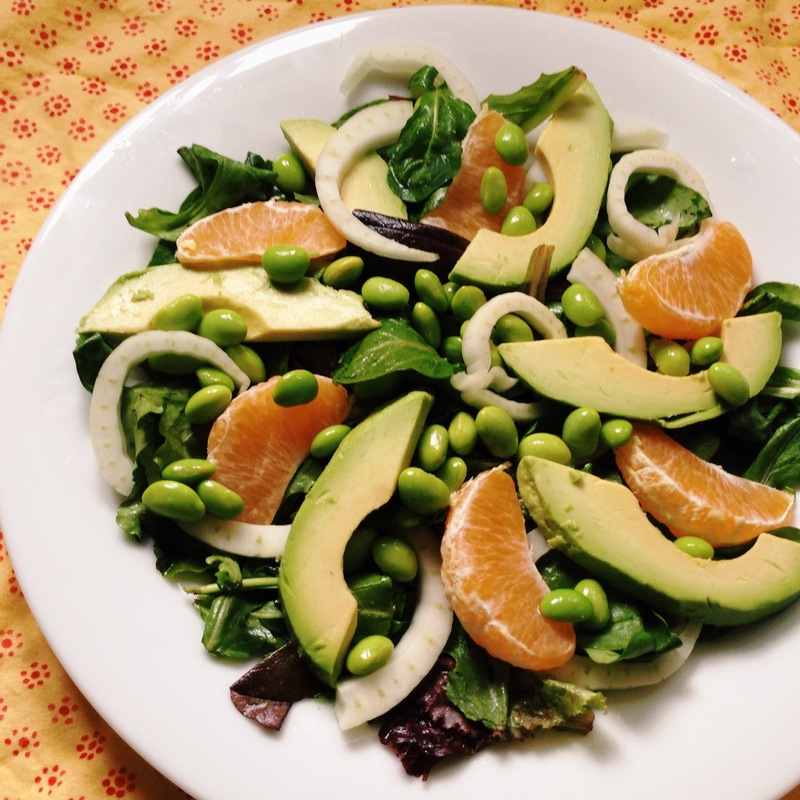 The lemon, salt, and olive oil also help aid this process, which works out well with the dressing for this salad. With the ingredients already so flavorful, a simple citrusy olive oil vinaigrette balances it all out nicely. 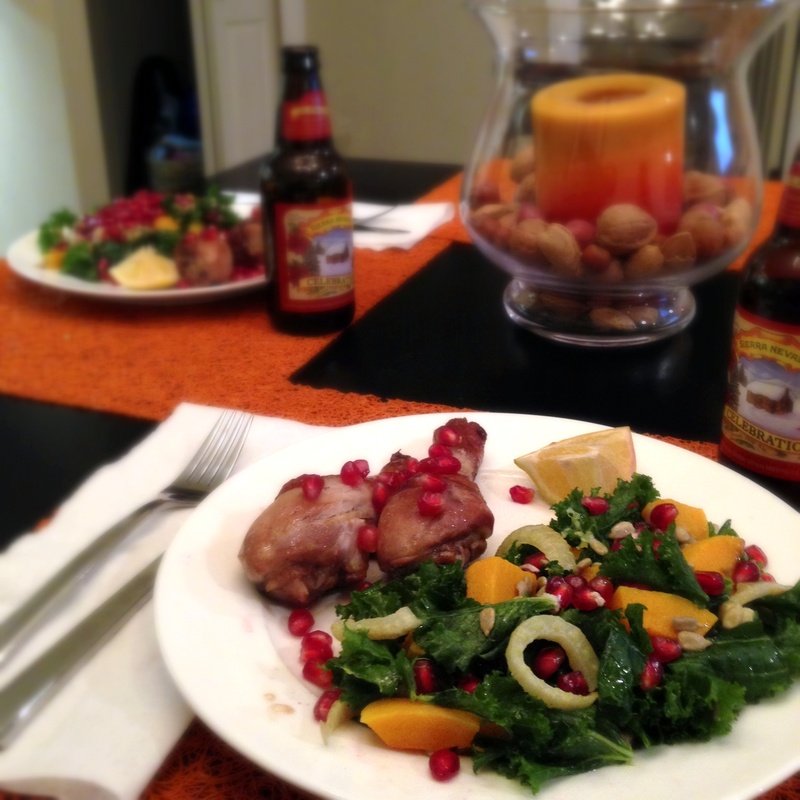 For those of you who are meat eaters, I served this salad with pomegranate chicken, inspired by this recipe that I saw on Pinterest. 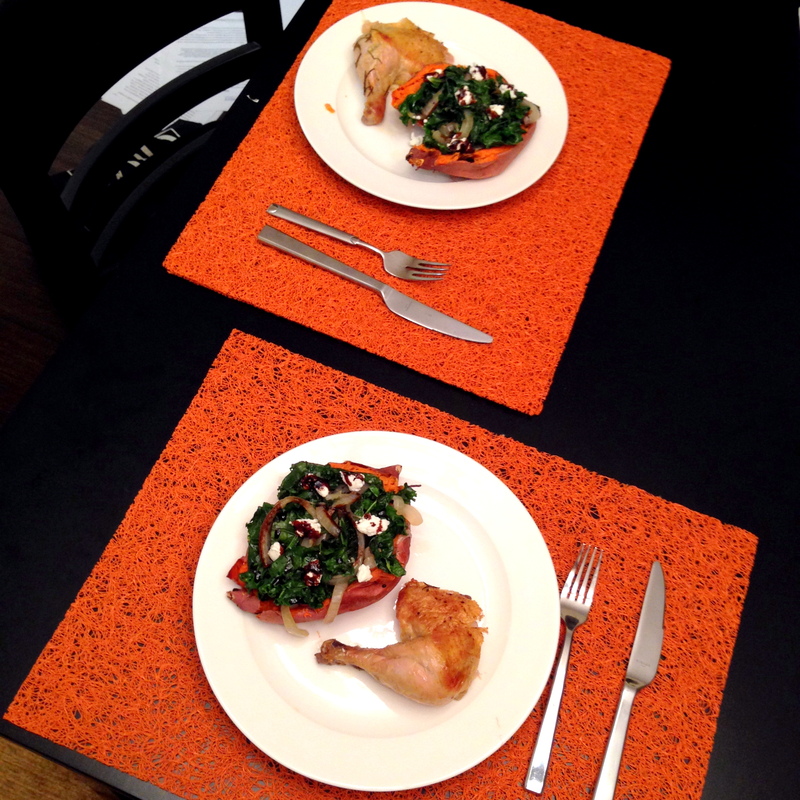 I didn’t follow the recipe exactly, because I didn’t have all the ingredients on hand, but overall the chicken and salad was a delicious and festive combination that I highly recommend! Hopefully you will enjoy your de-seeding, massaging, and snacking along the way as much as I did while making this recipe. Share and enjoy! Anyone who knows me can attest to the fact that I LOVE the holiday season. When the days are short and the cold is biting, Christmas makes it all so much better. I am a huge stickler for the traditions: stockings, cookies for Santa, reading the Night Before Christmas with my sisters, and even letters to Santa. But what I love even more is the holiday atmosphere in December: the bright lights, decorations, music, parties, treats, and sense of wanting to give back. For the sentimental like me, it’s the time of year I can relentlessly shower those I love with affection and, of course, sugar. Gift-giving is a major hobby of mine and I always try to get as crafty as possible this time of year, mostly because it’s much more fun giving things that are homemade (and obviously in part due to my grad school stipend limits!) 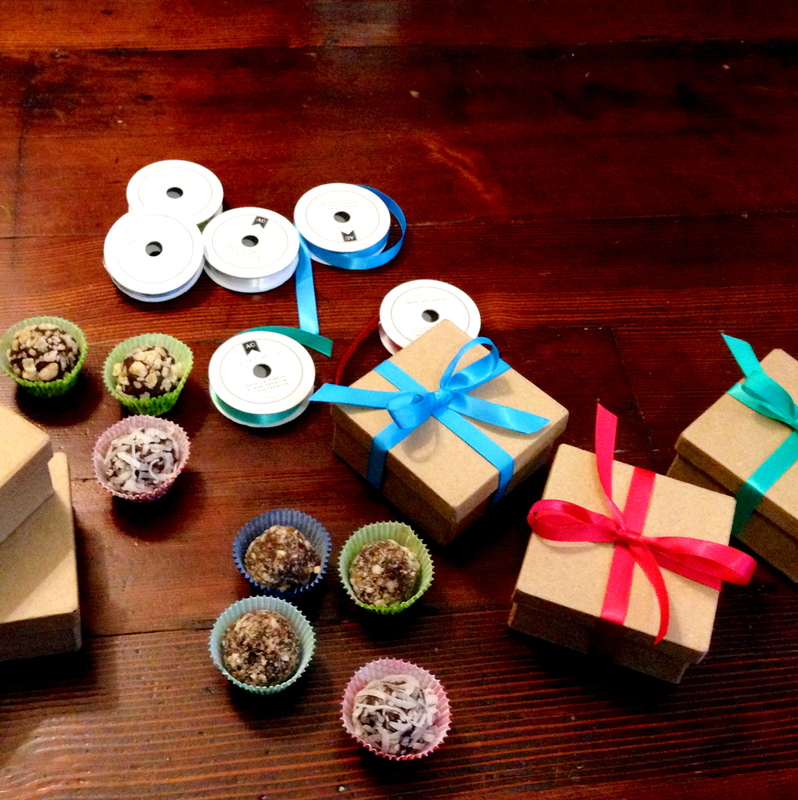 This year I decided to combine my two favorites: homemade gifts and “healthy” baking. And voila, so began the mass production of vegan truffles! They take a bit of time from start to finish with the heating and cooling and rolling, but overall such a easy recipe with very few ingredients. After Thanksgiving week gluttony, it is back to the grind! Which for me, also means a (short) break from baking sugary treats and transitioning back to healthy meals. Although eating pie for breakfast and dessert is wonderful, I needed to do something more positive for my nutritional well-being. After copious amounts of hearty food, I was craving something completely different, yet still comforting- and immediately though of miso and ginger…and eggplant! Yes, random, but that is what I do best. I’ve never experimented with miso before and am only familiar with it from the many bowls of miso soup I’ve had with sushi. There are valid nutritional reasons to cook with miso though. For those who are also new to the miso boat, it is a fermented paste made out of soybeans, rice or other grains, and koji, the “starter” for the fermenting process. Therefore it is full of good-for-you probiotics! There are also various types/colors of miso. The white miso has a mellower, sweeter flavor because it has a higher percentage of rice, whereas the red has a higher soybean content and is made with barley or other grains, giving it a more intense flavor. I used the white miso for this recipe, because I combined the miso with other Asian flavors such as soy sauce, rice vinegar, ginger, and sesame oil to create a sweet but tangy sauce. To keep this noodle dish light but also substantial enough for a meal, I threw in vegetables with a variety of colors and textures. The eggplant is especially great for vegetarian dishes because of it’s meaty texture and earthy flavor. It also soaks up flavors like a sponge. 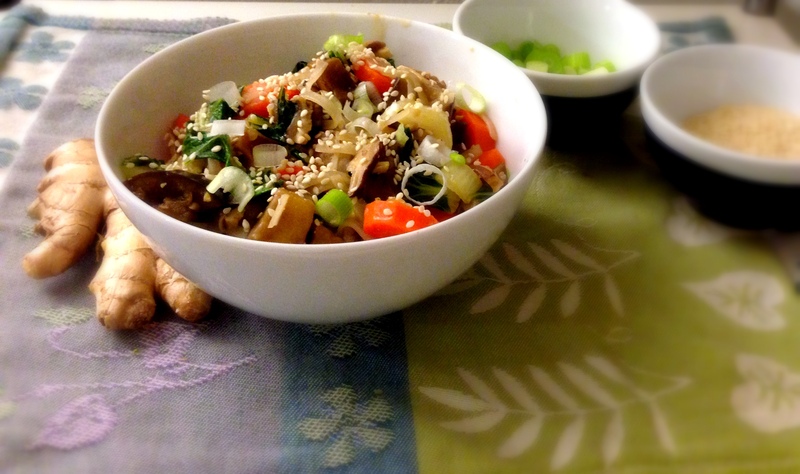 The bok choy and shiitakes are also a welcome change from the fall/winter rut of squashes and kale. So enjoy this new, healthy meal to start off your December and your tastebuds and tummy will thank you! Bananas are easily my least favorite fruit. I just don’t understand the appeal of the chalky, mushy, inevitably brown-spotted snack. Yet sometimes I still buy them because I hear they’re good for you and when still slightly green, they’re edible. As per usual though, the slightly green bananas on my counter quickly turned to spotted brown before I mustered up the interest to eat them. And the only thing I could think of to do with them besides throw them away was to bake. I’m also still soaking up all the flavors of fall and keeping warm with my chai tea, so the chai seemed like a perfect autumn addition to this classic muffin. And I’ve yet to add chocolate to a recipe which is shocking given my addiction, so I gave in to my natural impulses. I’ve been on a coconut kick lately, and love the use of coconut flour in muffins (remember the lemon rosemary? nostalgic moment for my first post ever…) so I came up with something using both coconut flour and oil, that still doesn’t actually give off the flavor of coconut. I also replaced egg with flax seed meal and water, not only to cater to vegans, but also for that nutty flavor and texture. 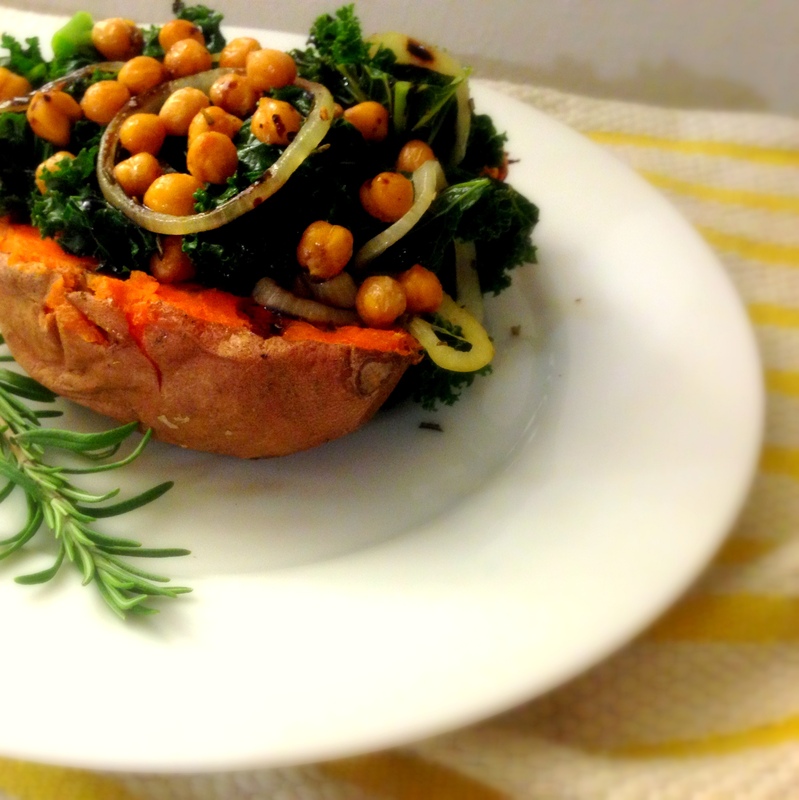 In this stuffed sweet potato recipe, for instance, you can easily roast just one potato and sauté only the amount of greens/onions you’d like for one. Or what I often do is make a whole bunch of the filling and save that, but only bake one potato at a time. Not only are the portions flexible in this recipe, but so are the fillings and accompaniments. I have made this sweet potato endless ways, and served it as an entire meal, as well as a side for roast chicken (see picture below). You can use any kind of leafy green, replace the onions with shallots, use a different type of bean, add goat cheese or feta, try different herbs, and even stuff a winter squash instead of potato. This is my favorite version, as well as the healthiest of those I’ve created so far. I call it Cozy Superfoods Unite. The rosemary pairs perfectly with the sweetness of the potato, the roasted chickpeas add a nice crunch, and the balsamic glaze adds a sweet tang that brings it all together with a bite. Not to mention it’s a lovely and ambitiously-nutritious meal to impress your friends with! Bon appétit! 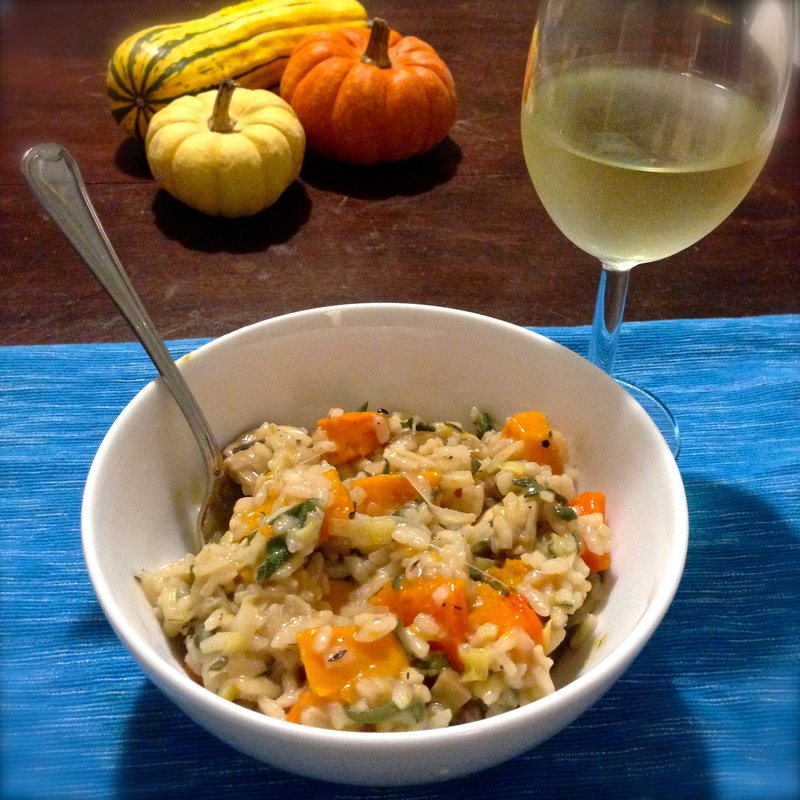 When I think of my go-to comfort foods, risotto is definitely in my top 5 list. Unfortunately it’s not the quickest recipe to make, but it’s always well-worth the wait. One of the reasons I enjoy it so much is that it can be prepared in such a variety of ways and it’s so difficult to mess it up (as long as you just keep stirring). WIth all the wonderful winter squashes in the front of the stores right now, I have stocked up my kitchen and am having no trouble finding ways to use them. This will be the first of many! I try my best to avoid dairy, and although risotto is typically made with cheese, it’s definitely not necessary. The cheese/milk is not what gives risotto its creaminess; it’s everything else that does. That being said, if you are a cheese-lover, parmesan is an excellent addition. Even without the cheese, this risotto is rich, comforting, and creamy but extremely healthy. The combination of sage and thyme gives it a unique flavor with a little bite, and the leeks in place of onion add a more complex flavor that goes perfectly with the squash and mushrooms. I’ve made this twice and used both delicata and butternut squash- both are delicious, and acorn or pumpkin would be as well. However, delicata and butternut are easier to use just because the skin is softer and easier to peel. Since you’ve already opened a bottle of white to be used in this recipe, pour yourself a glass as you cook and relax by the stove. Cheers! More cookies…I couldn’t resist! They are my favorite food group. I also am constantly volunteering to bring cookies to various parties or meetings so that’s my legitimate excuse. I had no choice but to bake this week! I have also realized it is helpful to bake on cold days in my little apartment because the oven heats the whole thing right up. So nice! There’s nothing better than a warm, cookie aroma-filled home. In thinking about various fall-flavored cookies, I knew I wanted to use fresh apple so I was originally planning on a caramel apple theme. But that just couldn’t excite me- everyone has had that combo before. I also wanted to make something completely vegan- and caramel does not fit in that category (although I could make it from scratch…future post?) As I was drinking my ginger tea it hit me…sugared ginger! I sometimes eat Trader Joe’s crystallized ginger as a snack but had never considered it as a baking ingredient. 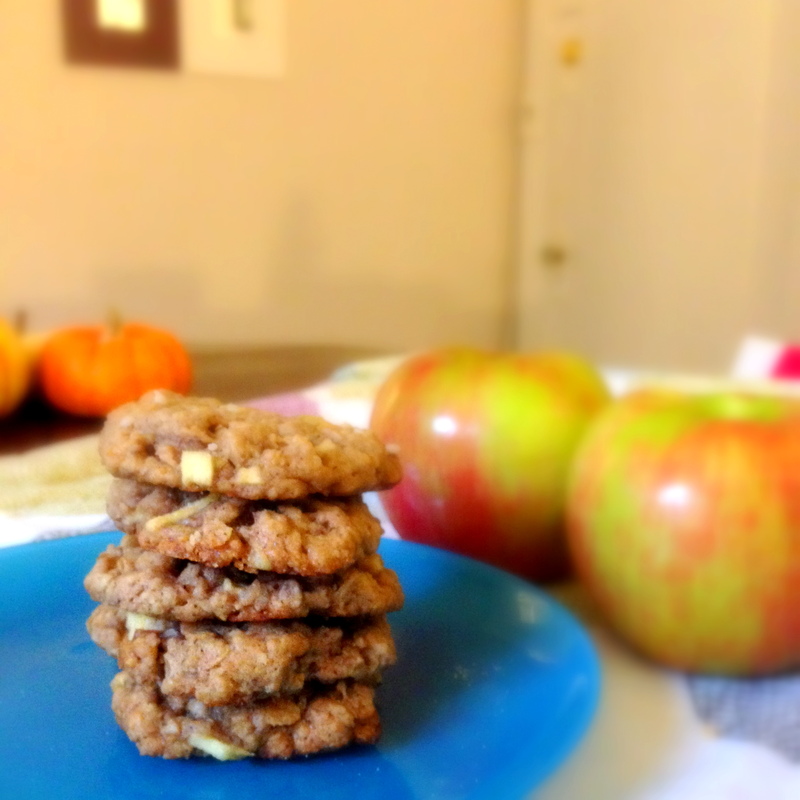 Immediately it seemed like the perfect accompaniment to my apple and oatmeal cookie. And low and behold, Whole Foods sells crystallized ginger in bite sized pieces that are perfect for adding to any baking recipe! Win. If you aren’t already sold on ginger, here is why you should be. (A) it is delicious in a multitude of forms: raw, pickled, crystallized, powdered, brewed. (B) it is great for digestion and can even help with motion-sickness and pretty much any other stomach ailment. (C) it is a natural anti-inflammatory so it helps relieve pain and even migraines. (D) it boosts your metabolism and improves blood circulation. That definitely makes it a super food! As a kid, I didn’t know what a fig was besides the filling of a fig newton. And I only had negative feelings toward fig newtons- how could they be put in the dessert aisle? They were far too healthy looking and tasting. Now that I’ve reached the ripe old age of 25, I have a much deeper appreciation and fondness for figs. These little gems are delicious in many forms- roasted with balsamic, sliced and served with crackers and cheese, wrapped in bacon, and best of all, made into jam. This was my first “jamming” experience, but it will most certainly not be my last! 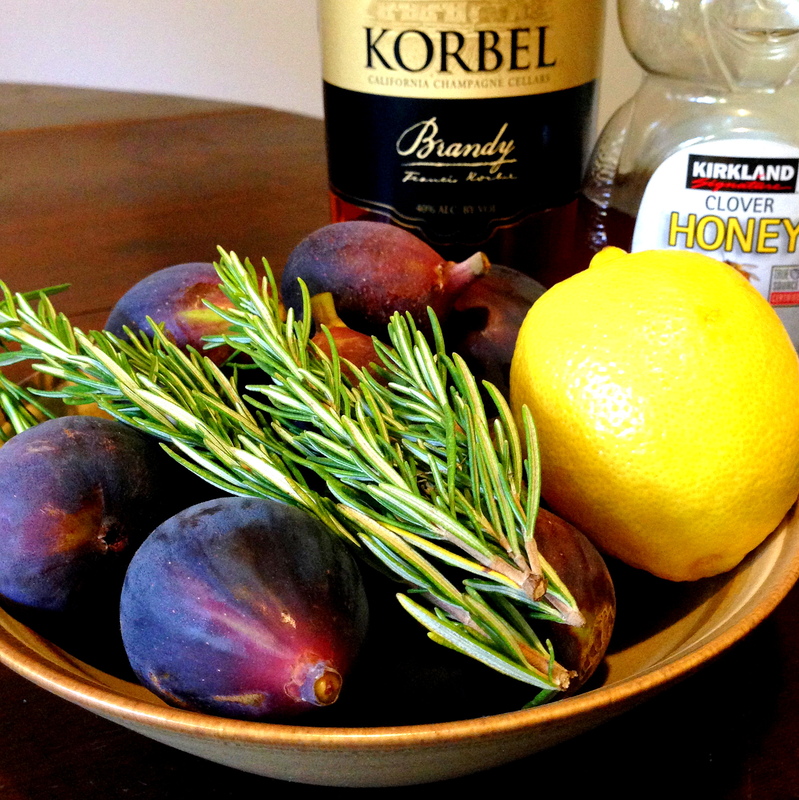 My initial inspiration for the combination of rosemary and fig came from a recipe on Pinterest I came across a couple of months ago. However, I also wanted to incorporate some other ideas I had including the addition of the sweet brandy flavor as well as whole rosemary leaves and lemon zest in the jam. Many recipes I’ve seen use dried figs, and this does speed up the process but I can assure you fresh figs make this extra delicious. Due to the cost of figs and my lack of interest in the whole canning process, this recipe only makes one small jar of jam, but a little bit goes a long way. The lemon’s acidity keeps the jam fresh for longer too, so you could definitely make more and save it to use with crackers and cheese or on your Sunday morning french toast! The possibilities for using this jam are obviously endless, but I decided it’s first appearance would be as the “gourmet” in my favorite lunchtime classic- the sandwich. Sandwiches have been a staple in my family since the beginning of time (well my time at least). I can’t remember ever going on a family outing or vacation without the sandwich production line in the morning and then someone asking in the car, “Who has the sandwiches? ?” My love for sandwiches has only grown stronger, not that I’ve outgrown PB&J and grown into using condiments such as caramelized onions, tapenade, or FIG JAM. And now that I’m back in school, I need delicious lunchbox treats like this to get me through the day! 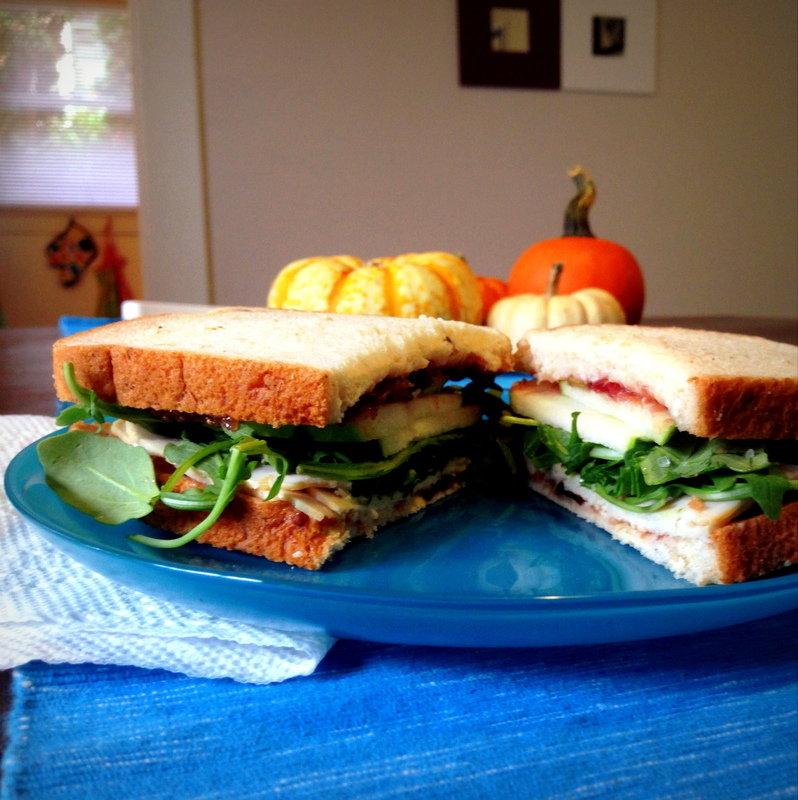 I based the rest of the ingredients in this sandwich on the fig jam and what would compliment it best – tart green apple, roasted turkey, and bitter arugula. This sandwich combines sweet, salty, tart, and spicy all in one. The optional mayo and/or cheese also adds a bit of creaminess, which is always a nice addition but not necessary and definitely a bit less healthy- so I’ll leave that one up to you. Any kind of bread works here- I made one with ciabatta and one with an oat nut sandwich bread- and I think I actually preferred the old-fashioned sliced bread because the tastes of the fillings were more pronounced. Choose your own adventure and happy lunching! The first day of fall passed and now it is winter! I’m honestly not sure what happened but one day it was sunny and then next I’m wearing my down coat. On the bright side, it is now perfectly acceptable to eat and drink pumpkin is mass quantities. (It is also now acceptable to wear my favorite smartwool socks and put my spaceheater fire-hazardly close to me wherever I happen to be in my apartment). It’s that time of year when the line at Starbucks is even longer and the customers are even more crazy – all for the pumpkin spice latte fix (I have fallen victim too…). Hence the recipe of the week- pumpkin cookies! If I hadn’t been making these cookies for the blog, I most likely would have added chocolate chips, but I wanted to do something a little more original and “fall-y” so I used toasted pecan pieces to give the cookies that same crunch. Since these cookies are gluten/grain-free and made with almond meal as the flour, nuts are a central theme and taste here. I also traded in coconut oil for the butter, my new favorite dairy-free substitute. These are sweet enough for dessert but healthy enough for a morning or afternoon snack. Note: they do have quite a different consistency than normal cookies- they’re more like pumpkin pie, both in taste and texture. The pumpkin puree gives them a moistness (I honestly tried so hard to avoid that word but you should thesaurus it and see the other suggestions- eek!) that lets it melt in your mouth. Happy fall and cheers to pumpkins! One of my biggest food pet peeves is the mislabeling of sweet potatoes in pretty much every grocery store and recipe. Fact: those orange fleshed taters are not yams. Neither are the pale yellow/white ones. Yams are actually a completely different species and have a gray bark-like skin. Check it out here. Not only do they look different, but sweet potatoes have more protein, fiber and vitamin A than yams. Maybe this isn’t news to some of you, or maybe you just don’t care as much as me, but I thought you should know. 🙂 This recipe calls for sweet potatoes (the orange/brown ones) which I have missed so much this summer. 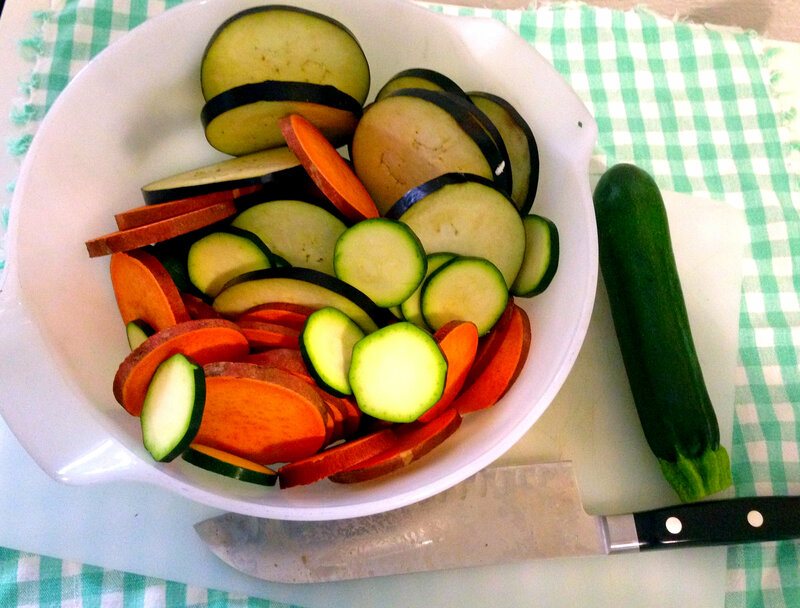 Warning: sweet potato recipes on this site may grow exponentially between now and February. I also wanted to experiment a bit with using a grain other than quinoa, and farro won. My sister cooks with farro pretty often and I always love those recipes of hers, so I decided to give it a go too. Similar to brown rice, farro has a nutty flavor and gives this salad a nice little crunch. Unlike rice or quinoa, farro retains the slight chewiness even if overcooked! I hadn’t realized how many types of farro there are either: pearl, semi-pearl, whole-grain…and I learned that whole-grain has the most nutrients (ha big surprise), but pearl is the fastest to cook. It’s up to you which you use in this recipe- they all taste good to me and they are all healthy, low-gluten options. This salad is best prepped ahead of time to allow the roasted beets, sweet potatoes, and farro to cool in the refrigerator before assembling. Like most of my salads, I like to individually plate each one (presentation is half the fun!). That being said, I have also packed this salad in tupperware (dressing separate until lunchtime) and it’s been an excellent to-go meal. Feel free to experiment with different roasted vegetables, depending on what’s in season. Also for a little more protein and crunch, pepitas (pumpkin seeds) or sunflower seeds are a nice addition to sprinkle on top. Enjoy!